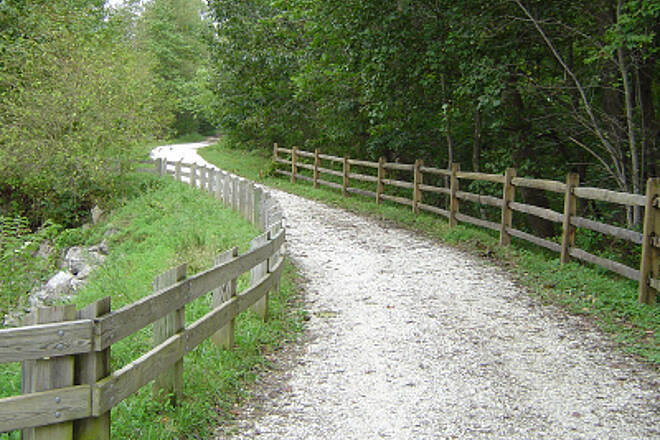 The Torrey C. Brown Rail Trail is one of the best hiking and biking trails in the Mid-Atlantic region. 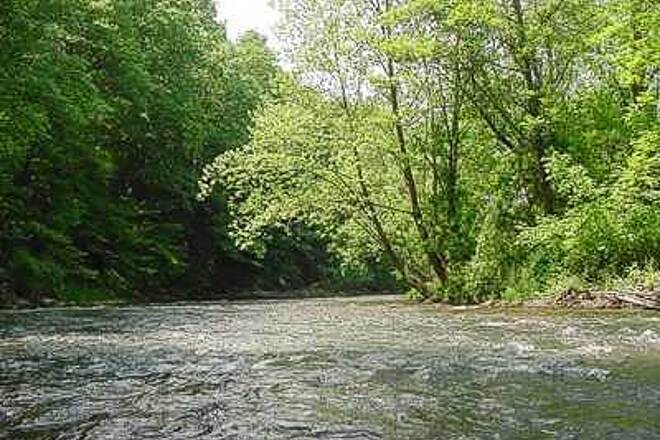 It allows for nearly 20 miles of flat travel, punctuated by a number of access points and an abundance of trees that provide refreshing shade on hot summer days. 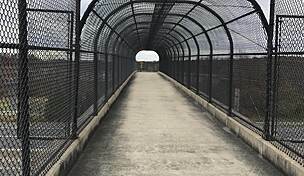 The trail begins in Cockeysville, Maryland, a suburb of Baltimore, and ends just over the state line in New Freedom, Pennsylvania, where the Mason-Dixon Line divides the southern Atlantic states from the Northeastern states. 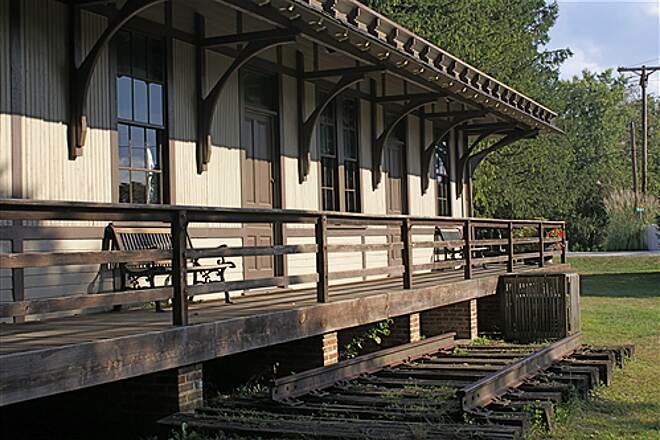 The history of the rail corridor dates back to 1832, when the Northern Central Railroad carried passengers—people vacationing at Bentley Springs—and freight between Baltimore and York or Harrisburg, Pennsylvania. The railroad ran for 140 years until Hurricane Agnes devastated the tracks. 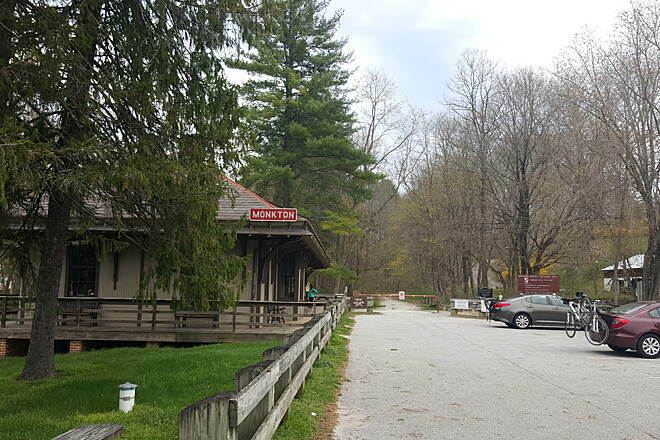 Trail goers can learn more about its history at Monkton Station, which dates back to 1898 and today serves as a visitors center and museum. A rental shop here offers both bikes and inner tubes for floating down the Big Gunpowder River, which parallels the southern end of the trail. 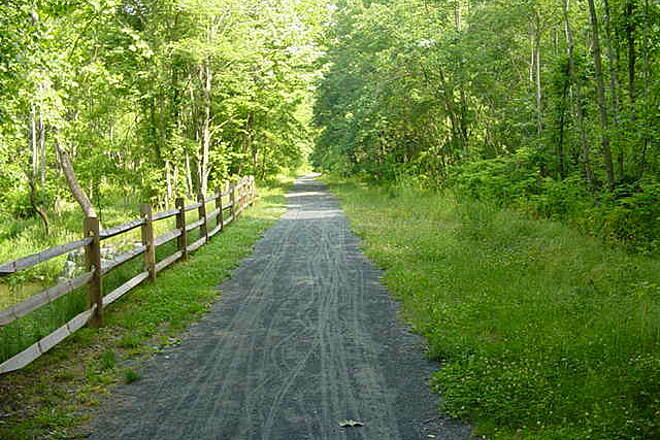 The rail-trail is managed by the Maryland Department of Natural Resources as part of the Gunpowder Falls State Park. Its first phase—a 7.2-mile stretch from its southern end at Ashland up to Monkton—opened in 1984. 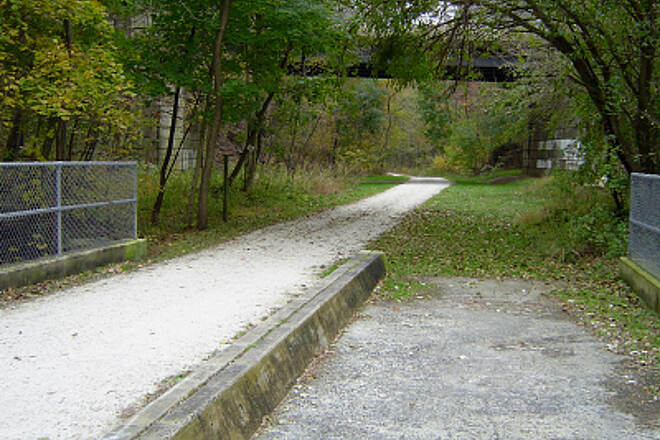 The organization was led by Secretary Torrey C. Brown at the time and the pathway, originally called the Northern Central Railroad Trail, was renamed in his honor in 2007. 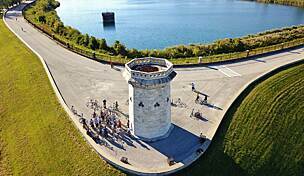 Amenities along the route include picnic and park benches, drinking fountains for hikers, bikers and four-legged friends, and portable restrooms. Just off the trail you can enjoy a small art gallery, an antique shop and several places to buy food and drinks. Hotels and motels can also be found within a mile of the trail. 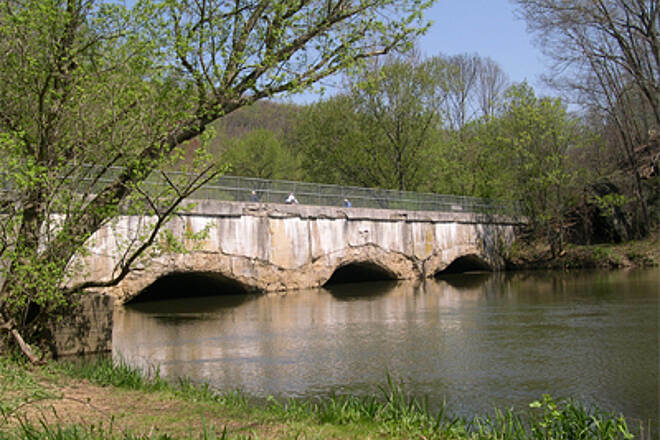 The trail cuts through several charming Maryland towns: Monkton, Parkton, Falls Overlook and Bentley Springs. 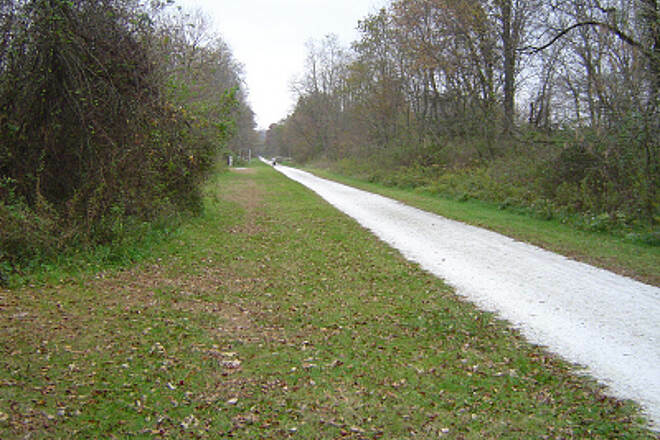 At the MD–PA border near New Freedom, the trail continues as the Heritage Rail Trail County Park. Together, the Torrey C. Brown Rail Trail and the Heritage Rail Trail were inducted into the Rail-Trail Hall of Fame in 2015. 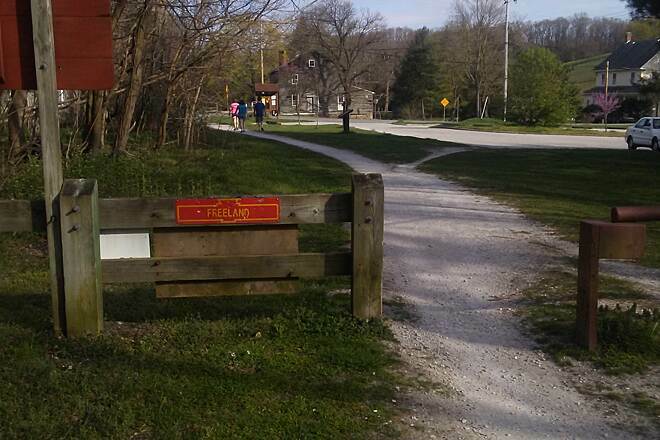 The trail is used by an eclectic mix of horseback riders, joggers, walkers, hikers, bikers and people of all ages. 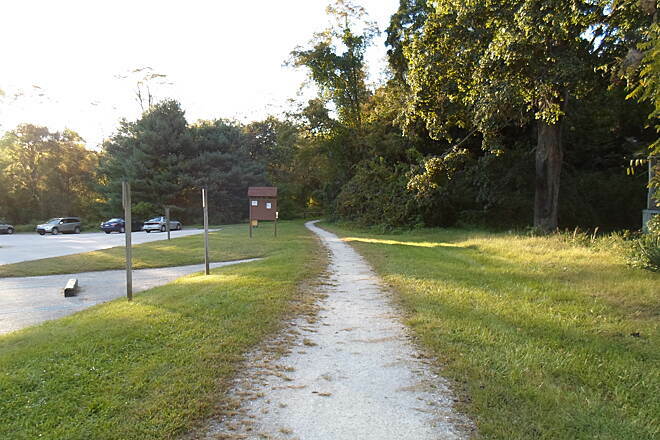 On the weekends, the trail is heavily used by local residents and travelers from the Baltimore area, so parking may be a challenge. 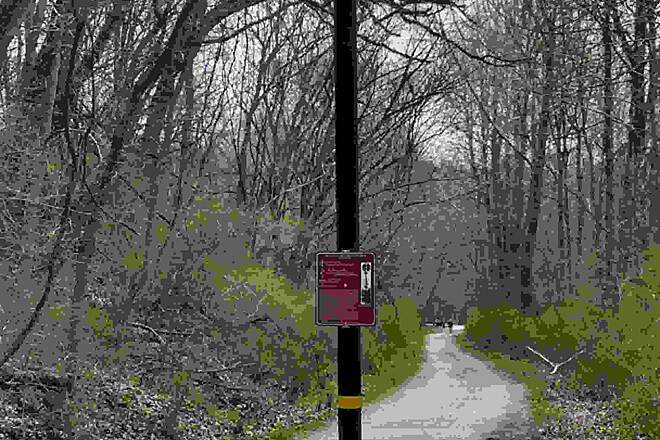 For those seeking an escape from the urban areas of the region, this trail is a wooded oasis—an escape from the every day stresses of nearby city life. 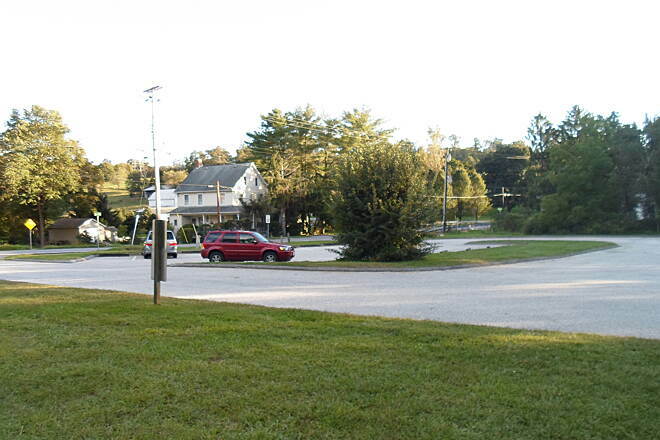 The southernmost trailhead and parking area is located just off York Road/State Route 45 in Cockeysville. 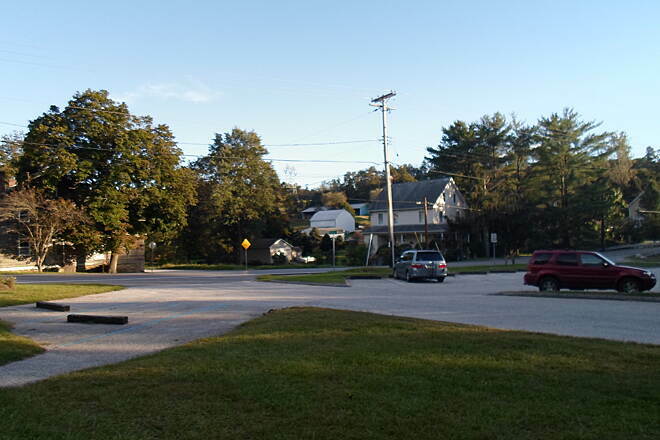 A larger and more popular parking lot is located just a half-mile farther north along Paper Mill Road. There are numerous other access points and parking areas along the entire route; refer to the map for more details. 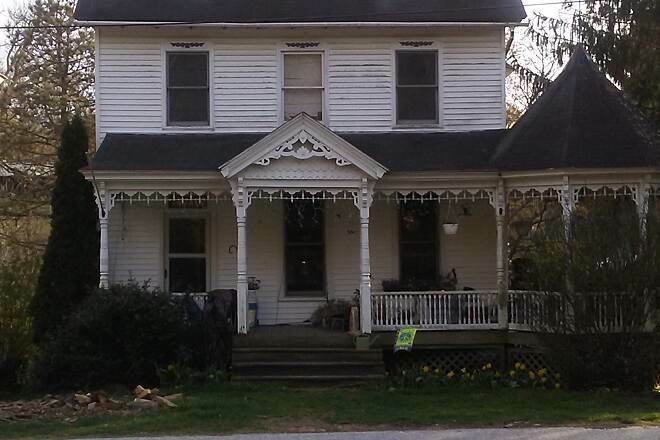 My husband and I just moved to the area. Decided to enjoy the beautiful weather and hit the trail. Let me say, we don’t ride a lot but knew we wanted more than a few miles. WELL....needless to say we rode from one end to the other AND back. ¿¿ Beautiful day, beautiful ride but 40 miles was an over kill for me. My husband loved it of course and wants to go back by himself to see how fast he can ride it in. Great trail, great ride! 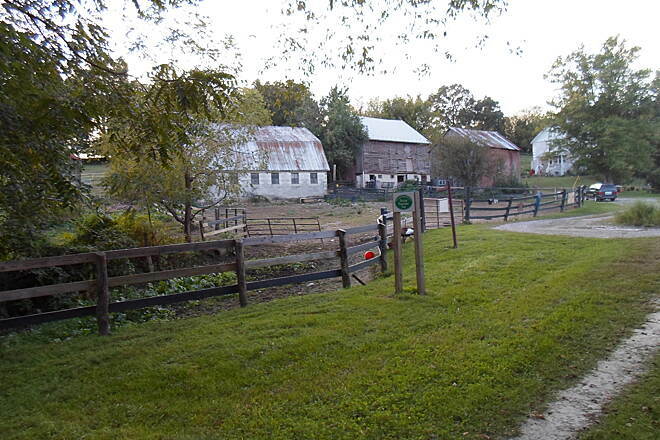 Began this ride north of the trail at Railroad PA along the Heritage Trail that joins the Torrey (also named NCR). The day was brisk, sunny and dry. Trail conditions for a rail-trail were very good. 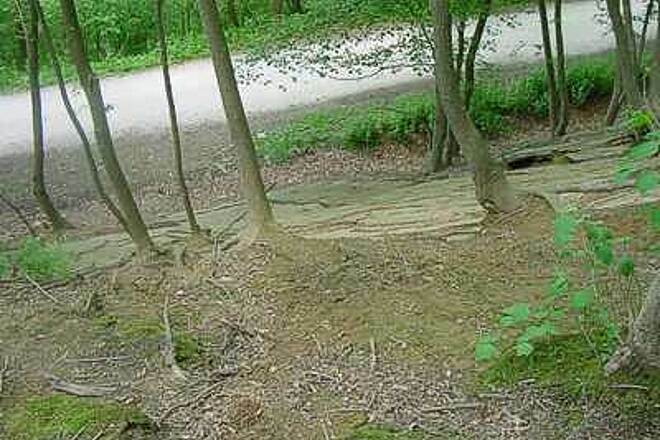 The majority of the trail is tree-lined and shaded. At times the trail was 'two-track' but mostly sufficiently wide to ride two-abreast if traffic permitted. My ride was on a weekday, so traffic was light. The trail offers a lot of rail history if one is so inclined to enjoy in addition to the outdoors. This was our first trip to New Freedom, PA and our first ride on the Brown. The scenery is wonderful and the natural canopy was wonderful on this 90 degree day. I'm not sure why the trail guide has you go to a entry point without parking while there is plenty of parking at the train station less than a mile away. Plus you have the opportunity to see or ride the train which is a fun draw to the area. As for my wish list, I wish the surface was wider and more developed. The guide says crushed stone but it is mostly packed dirt with two tracks---one in each direction. Every now and then we had the typical crazies acting like they were in a race. With the uncertain surface and its narrow access, it was dangerous from time to time. There is no food along the trail except for ice cream bars at Monkton station and a few miles down trail from New Freedom where a homeowner has a little stand with snacks and wa Yer. Lastly, there is a tube float place in Monkton and 100s of people were walking 2 miles up the trail with the tubes. They spanned the trail and wouldn't move for cyclist. Scary and dangerous. While we saw deer, turtles, a snake and a crane, our overall enjoyment was somewhat dampened by the floaters and the lack of food on the trail. I have ridden this trail for over 10 years now and I have never been so disappointed as this time. I have noticed in the last couple of years the MD section of it has gotten really bad. 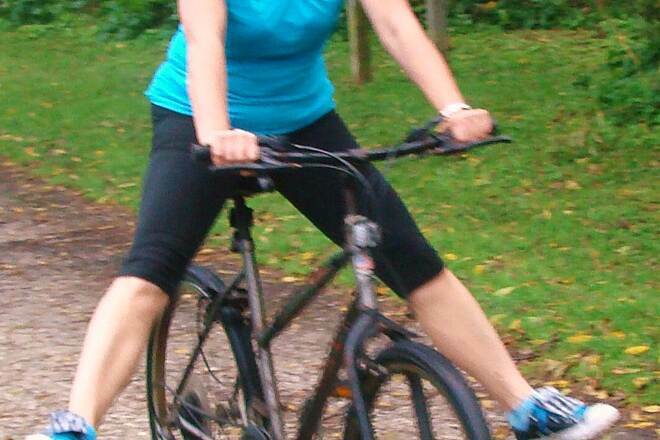 I had many times where the mud was so bad that I could barely pedal my bike. I had multiple times where I almost fell over. I even tried to ride on the side of the trail but it did not help. Even the people walking the trail were going around the muddy spots. I'm pretty sure it has not rained very much so I cannot understand the condition of the trail. My In-Laws live in York and I like to ride the whole trail. However, I will be skipping MD next time and riding in PA instead.The PA section is always very well maintained so I cannot understand why there is such a difference between the two. Could someone please explain this to me. I would really appreciate it. Thanks. Although we were affected by the "Tack Attack" on our Aug 3 round trip ride - 43 miles, Ashland> New Freedom> Ashland (1 front flat, northbound, 3.5 miles from New Freedom - which has a bicycle shop, thank heavens) - we decided to do the trail again Sept 2, this time 41 miles, one-way, York> Ashland; we had a wonderful day. Easily located York City parking lot had a good number of spaces available, at noon. The trail offers pastoral views, good sense of security, and seemed well maintained on both sides of the state border, to me, for hybrid bike use. There are several possible lunch spots on the Pa side (we like Paesano's, in New Freedom), and places to picnic (but no shops/restaurants) on the Md side - even in Cockeysville (Ashland), the local eateries are on the main highway, not trail-side. But, all in all, this is a wonderful asset to the outdoor activity enthusiasts. I've been looking for a trail that has so much to offer, It's my new go to spot to get miles in. DNR does a great job and saw several crews working which was nice. Parking can be tough so have a plan B for another lot. May the wind stay on your back! We started in Cockeysville and headed north to York. 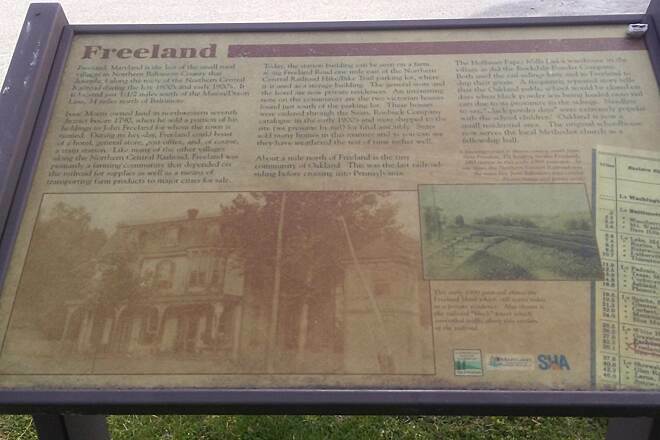 We soon discovered that the Pennsylvania end or the Heritage Trail, was much better maintained throughout, embraced by local towns and governments, and frankly better. They were working on improvements but they made the trail soft and hard to ride through. I have been worried about the tack issue and we rode the NCR trail yesterday (20-AUG) for the first time in several weeks. Had no issues and did not see anyone dealing with flats unlike two weeks ago when people were pushing their bikes due to the tacks in a couple of places (in PA as well). I have been riding this trail for 25 years and I am sorry to see it not as well maintained as it used to be. More muddy spots and lots of limbs that you really have to watch out when it’s getting dark. Not sure why? We ride the connected YHT in PA and are always very impressed with the quality of the trail and how well its maintained. Also, In PA they had signs about the tack issue with rewards posted but did not see anything in Maryland. Hopefully with it being well known the idiots will refrain from doing this again. We have lived within half a mile of this trail for the last 26 years, during which it has had one major resurfacing and a number of patch jobs. But now the state seems to have given up on even the patch jobs. Even after many dry days in summer, there are muddy spots everywhere. This summer my wife just gave up and turned back, too scared to ford one which completely covered the trail for maybe 20-30 feet. Those who have made it across of course leave deep mud tracks which can interfere with steering control. In the past these spots were few and far between, never so large and so many, and usually after considerable rain. 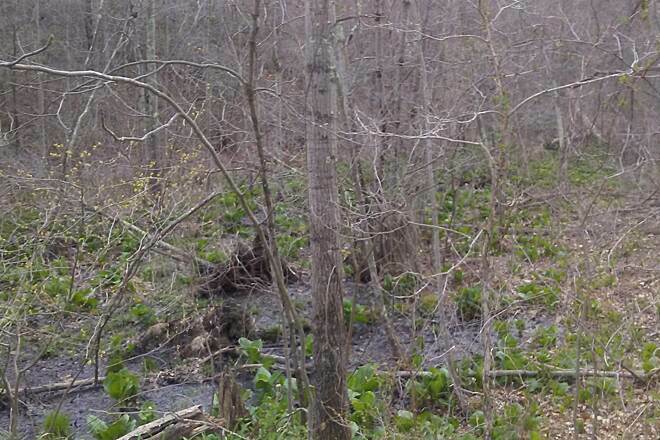 The surface is crushed limestone, and if this is not maintained, mud takes over, and in this area that is mostly dense clay, which is not porous, so the water just sits there making more mud. After riding north from Parkton to the PA line, this morning (8/7/2016), I experienced a flat after an upholstery tack inserted into my tire --just south of reaching the PA line. Walkers seeing me changing my tube at the PA rest area informed me that tacks were dispensed on the trail at various locations in PA and Northern MD in the last few weeks. Although they indicated that most were retrieved by way of magnets, obviously they were not all found. We have decided to no longer ride the trail for awhile. 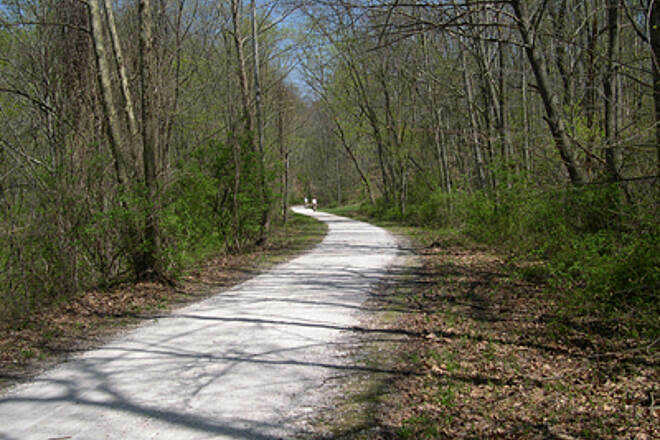 Also known as the North Central Railroad (NCR) trail, this trail is perfect for anyone, well maintained surface, relatively flat with amenities like benches, picnic tables and port-a-johns along the route. Frequented by joggers, dog walkers and bikers but normally not overly crowded even on nice weekends. Plenty of places to jump on-off trail allow you to customize your ride. 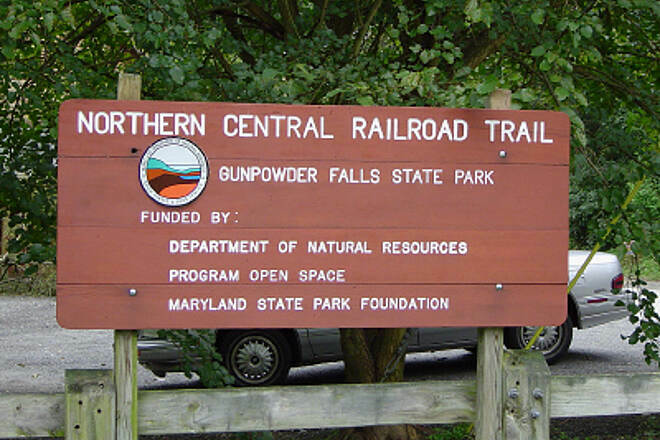 Notable trial locals include the Sparks Bank Nature Center in Sparks, MD and the Monkton Railroad Station (Ranger Station) in Monkton - Both have Port-a-pots, water points, picnic tables and limited parking. 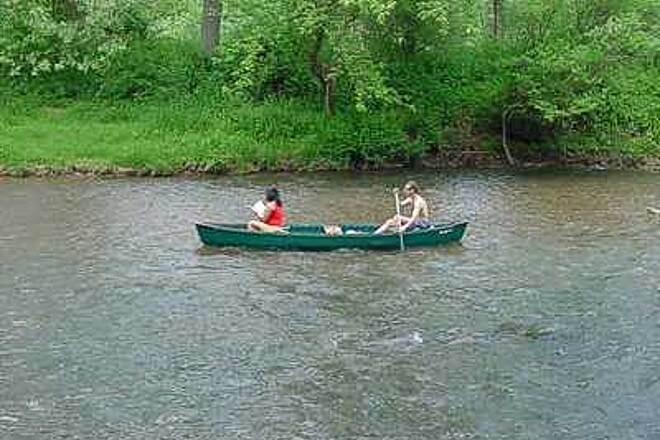 Also available at Monkton are tubing rentals to float down the Big Gunpowder Falls. The trail is well shaded so even on a hot day, the temperatures are tolerable. 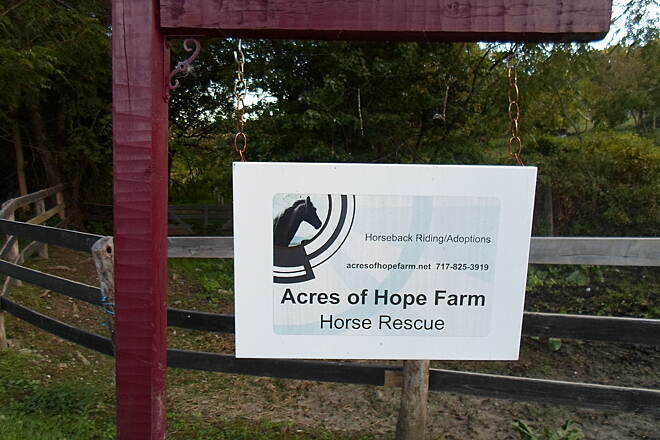 If you are just getting into Trail riding, this would definitely be a great introduction. Simply wonderful from White Hall (11 mile post) to Ashland (0 mile post) and back. I was concerned about conditions after the extended rains we had all Spring. Today I found an evenly packed surface that provided an excellent roll. Occasional marshy areas still occur around natural seeps, but they are few and drying. The shade canopy is complete providing cover about 85% of the trip. A great start to the Summer. My husband and I took our two little dogs for the first time on this trail and we absolutely fell in love with it. Very peaceful and quiet, we couldn't stop walking. 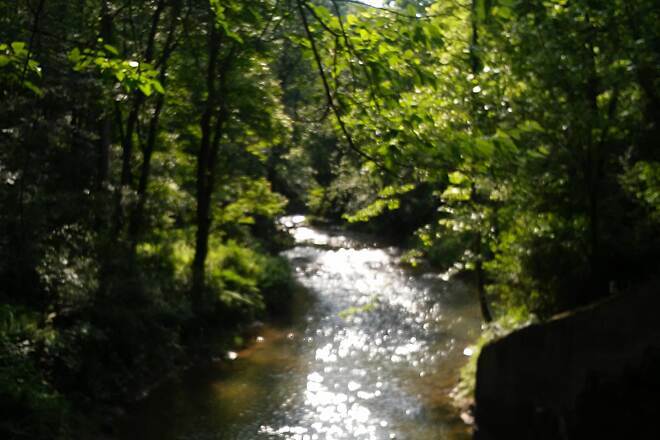 We walked for about 4 miles and it's mostly a wooded area, but it's very serene. We expect to be go again many more times. Outstanding trail, have ridden several times. 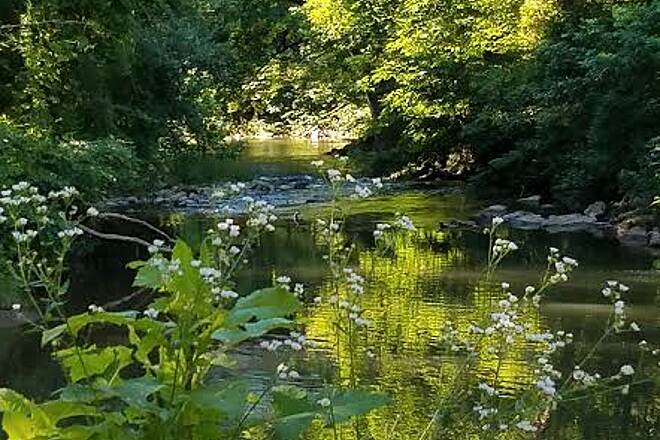 Very bucolic, verdant, quiet, never crowded, very good surface, very interesting adjacent water by the Gunpowder Falls creek which becomes very beautiful mid trail with small waterfalls. North end of trail with classic small American town of New Freedom which has an operating wood burning train and a nice bike shop. 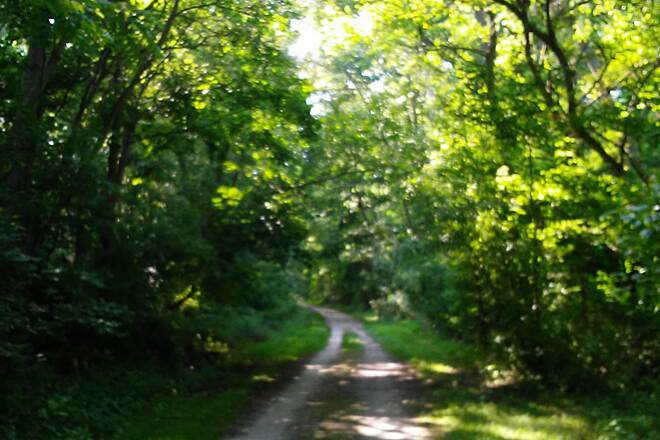 Biked this trail today (6/7/15) from Paper Mill Rd to Monkton and back. The trail is in great shape and has many interesting things to see. The restrooms were clean and the water fountains in good working order. 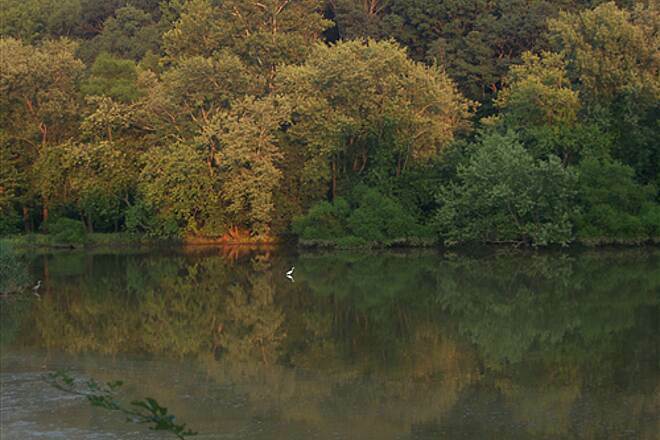 The Sparks Bank Nature Center has finally reopened after repairs from flooding during hurricane Sandy. I recommend a visit, especially for children. People on the trail were very friendly and courteous. I had no trouble finding parking at the Paper Mill lot. My wife dropped me off in Ashland and we met up for lunch in New Freedom at Paesano's Pizza . We split a meat lovers Stromboli and a salad. Excellent eating. The weather was great, the trail surface in good shape, and nice little communities along the way. I did not know before riding this trail that it was the route Lincoln took from Washington going to give the Gettysburg address. We rode the trail today from Cockeysville, MD to New Freedom today. Plenty of parking, beautiful scenery, and friendly trail-users. We had lunch at Paesano's Pizza in New Freedom (biker friendly and yummy). The uphill climb to New Freedom was a great work-out and made for a quick ride back. 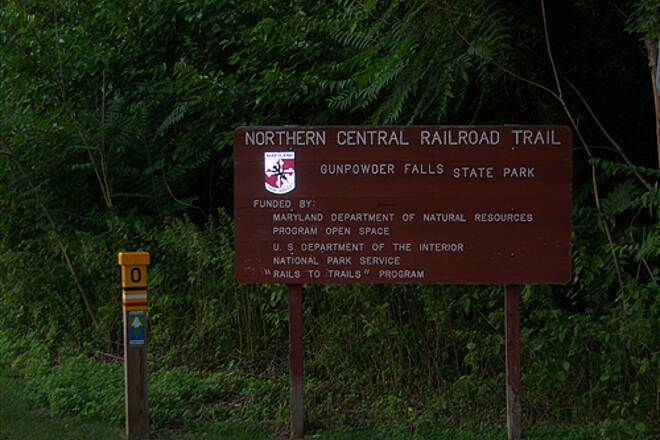 In late 2014 my wife and I took a summer end-to-end an return on the Torrey C. Brown (Northern Central Railroad Trail) and the York County Heritage Rail Trail starting in Ashland, MD and ending in York, PA. We called ahead and got permission from the State Park to leave the car overnight in the lot in Ashland. The lot fills quickly with early morning runners (one spot left when we arrived at 7am), but there is another parking lot about .9 miles ahead. There is just the right amount of tree cover to make it pretty cool for the early morning ride. The trail was busy in the morning and we saw quite a few runners. The trail was in excellent condition and gave a very smooth ride. 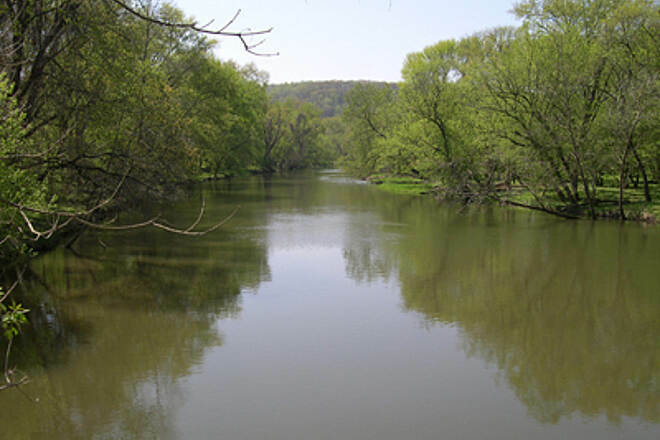 You travel along the water through several small towns before you reach the halfway point at the Pennsylvania border. Right after the border you reach a nice little town called New Freedom, PA. You can stop to relax and have some lunch in the town. 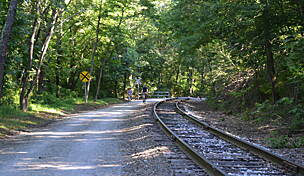 Once you cross the Mason-Dixon Line and you are in Pennsylvania, the trail becomes the York County Heritage Rail Trail. It is a bit over 20 miles to reach York, PA. The trail is also in excellent condition, has some towns along the way and some more nice stuff to see. There are some active rails on this part for tourism during the summer and you will have the chance to see other people riding and walking. There are other small towns that you can stop at to eat or get ice cream. 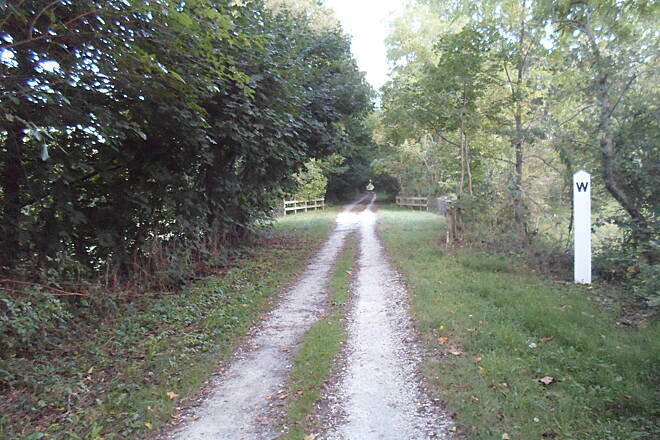 As the continue and you get closer to York the trail surroundings starts to become less rural and more urban. We traveled to the end of the trail, which was now asphalt, took some pictures and then worked our way to the hotel for the night. I suggest catching a York Revolution’s baseball game if they have a home game. We decided to ride to York first because I did not see anywhere near Ashland, MD to stay overnight. Actually there is a city pretty close by bike near Ashland that has hotels and restaurants, so you can actually take the end-to-end trip from either direction. The trail is very flat and has little grade. I believe you go uphill all the way to the Maryland border and then downhill to York, but you can barely tell the difference. The 40+ miles each day is doable. The last 5-10 are the toughest but if you keep your mind on the cold beer at the end of the ride you can make it easy! 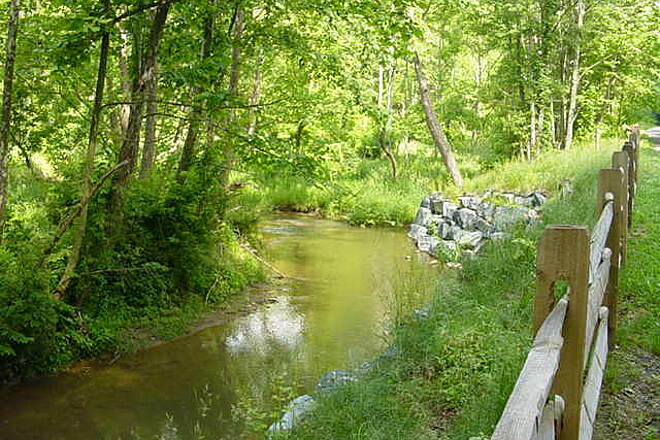 Just bought my hybrid Trek less than two weeks ago, and, living in Fallston, Md, am used to the Ma&Pa Trails in Harford County. Rode the Torrey Brown Trail for the first time ever this past Saturday, going north, with two friends, from the Phoenix Rd lot just over four miles, for a round trip of a little over 8 miles. Went back Sunday morning for a 21 mile round trip, up past Monkton and White Hall. Through this area, I found the trail to be sheer joy. Mostly level, with a generally smoothish surface. 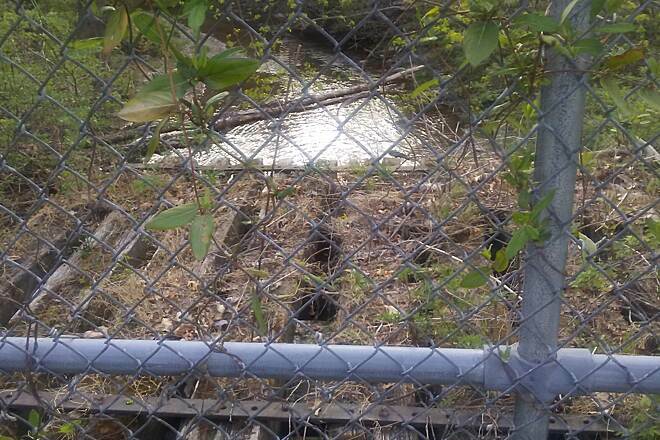 There are a couple stretches where the trail seems to narrow to perhaps 6 feet wide. 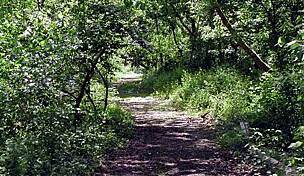 But I absolutely love this trail, and plan to use it every weekend possible. My goal for this year is to go from Phoenix Rd to New Freedom, Pa and back. I cant recommend this trail strongly enough. This beautiful trail is oftentimes ruined by users who have no trail etiquette - pedestrians who allow their dogs to go unleashed; trail cyclists who speed (yes, there is a speed limit on this trail); trail cyclists who fail to use mirrors, stay to the right, stop on the trail, wear earbuds; road cyclists who ride in groups, thinking they're part of Le Tour and mistakenly think they enjoy all the rights of way they have on the road; general rudeness of all types of users who simply don't acknowledge other trail users. One can encounter all of these types of offenders in just one excursion. And don't get me started on the mushing sled dog enthusiast below. I have encountered these fools on several occasions. Some nerve calling out "slow" humans when you could use some exercise yourselves. The southern half of the Maryland side is more scenic and more crowded. The northern half, less so. Very few amenities and services at all. Please practice "pack it in, pack it out". And say "hello", "good morning", "on your left" - say anything to announce your presence and acknowledge other users. 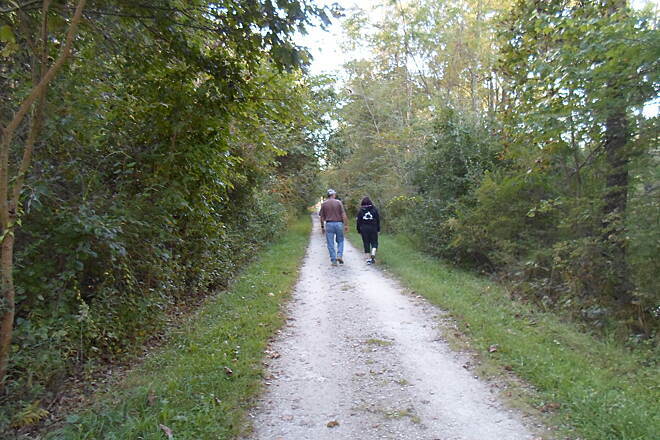 Been walking, biking and horseback riding this trail plenty of times over the years. 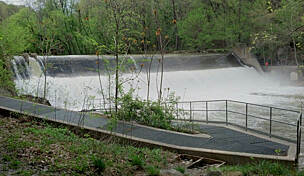 Check out http://ab3bo.com/KRCWP/ for images and info from along the trail both in Maryland and Pennsylvania. I rode to the zero point on the Torrey Trail from the Heritage Trail starting in Seven Valleys, PA (79 miles), and there was a very noticeable difference between the stone grade used in Maryland versus the stone that was used in Pennsylvania. It was larger stone, and it was noticeably rougher in the saddle. My straight-bar, GIANT hybrid handled it well though. The majority of it was downhill heading south, so it made half of the southward trail pass quickly. I reached the 15mph speed limit for the first time on the Torrey Trail and it was nice to coast for a bit. There was a growth of grass up the middle of the path, at various points, which gave the illusion that motor vehicles utilize the trail way. Signs state that motorized vehicles are not allowed, so I assume the growth is a result of lax maintenance. It was very scenic and otherworldly in its remoteness at some points which is something that I really enjoyed. I saw more people on the Torrey Trail than I had on the Heritage Trail, and it was pleasant. I passed several of the same people on my way back north and we readily exchanged smiles and courtesy nods which was a cumulatively enriching part of the trail experience. A young buck crossed the trail around mile 3 of my return trip, and I stopped so that we could gaze at each other. There was a lot of uphill riding heading back, and I hit my isotonic drink pack pretty hard to make it up, but it felt great once I was back on level ground again. I would recommend that this trail be ridden with riding gloves and padded saddle shorts for hybrid bikes, or likewise, if you are not into having the extra gear, a mountain or cruiser bike with beefy-tires and a shock absorbent saddle/fork would easily handle the trail surface. From what I experienced, the vibration on the hybrid caused discomfort in my shoulders and glutes, but it comes with the territory on this type of surface. Gear up and ride on. It was worth it in the long run. 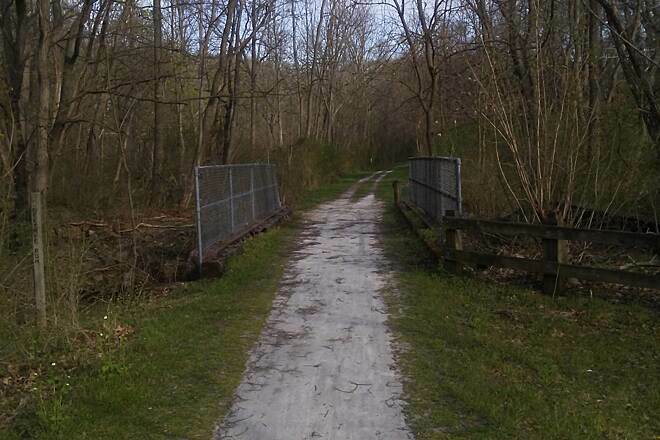 I rode from Seven Valleys to the Maryland border today for my first journey on this trail. While it was a little tough heading south between Glen Rock and New Freedom because of the slight uphill grade, I really liked the trail. It was beautiful, it had some history to watch along the way and the people I encountered seemed friendly. Heaven on Earth. Beautiful beyond words. Pretty much shaded the entire way. It is even pleasant on a 95 degree day. On Saturday of Labor Day weekend I rode my recumbent trike (Catrike Road) six miles south from New Freedom and back. Much of the trail has deteriorated to two narrow single tracks. Grass is growing in clumps in the middle. 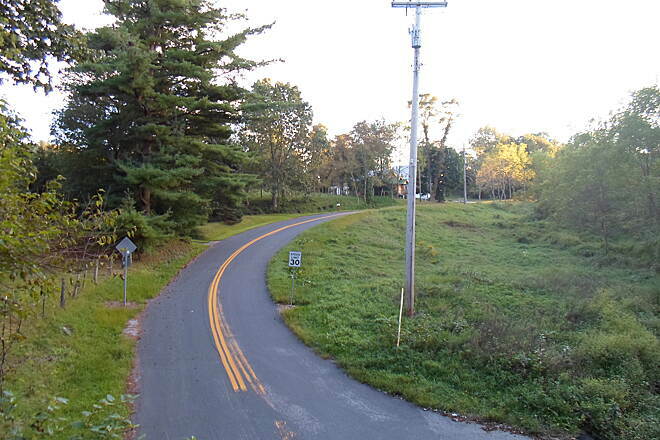 Compared to the Pennsylvania portion which I also rode six miles north and return, it is seriously deficient. The scenery on the sides of the trail is very nice, but the trail itself is not. 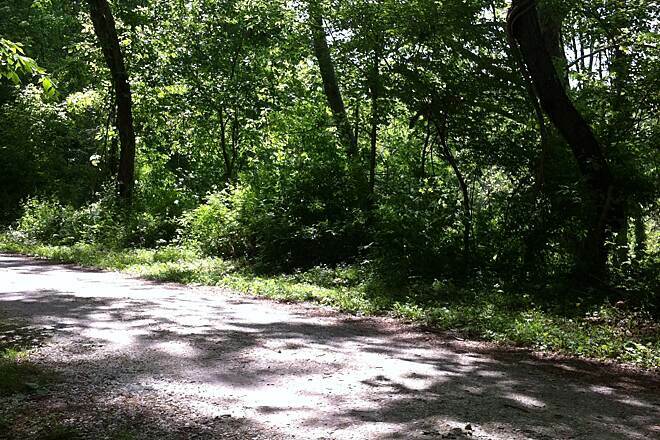 It's our "go-to" trail. Perfect for Hybrid bikes, crushed gravel and flat. Our Usual starting point is Parkton and we have rode both North and South from this location. 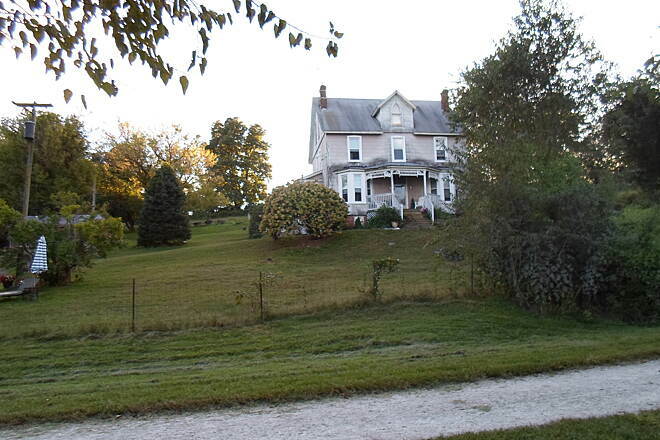 Easy access from I-83. I'm from the Pacific Northwest, so I'm kind of a snob when it comes to nature and the outdoors. 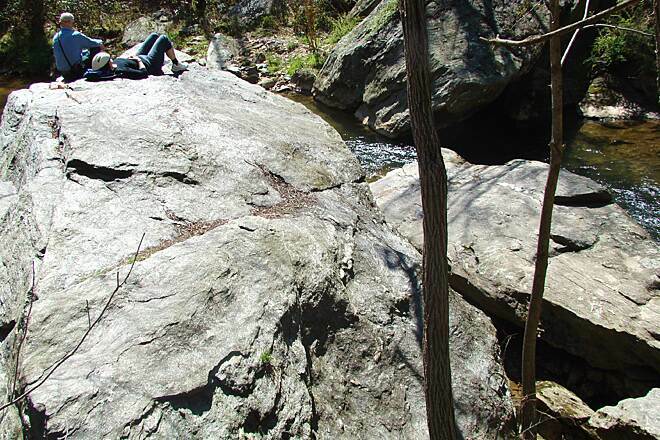 I've been living out in the Mid-Atlantic for several years now, and continuously look for good places to venture outdoors. I just discovered this trail today, and was pleasantly surprised! Even for being a holiday weekend, it wasn't too busy and it was very peaceful. I like that it's an unfinished trail so you still feel like it's a little more rugged than just being on a paved trail through a park. I rode my mountain bike on the trail and felt that I got a nice leisurely ride while still being able to go fast enough to get a good workout. I would definitely recommend this trail!! 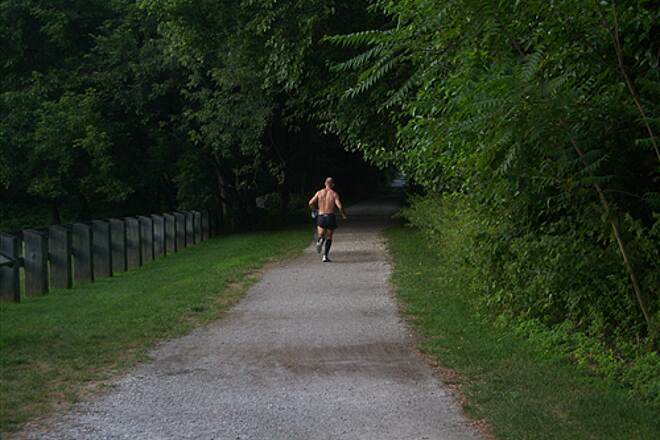 This has got to be one of the nicest trails anywhere in the Mid-Atlantic area. 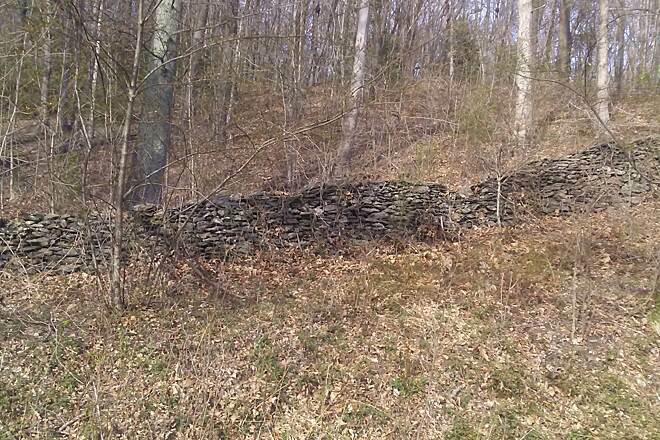 It's about 20 miles from the trailhead in Hunt Valley to the Maryland/Pennsylvania line. Along the way, the trail provides a scenic and peaceful respite for runners, bikers, hikers, and I see from a recent review, even mushers, which is a new one on me. The entire trail is dirt and crushed stone. It can be somewhat rough (and muddy) at times, but it is mostly well maintained and manageable on any bike, except for a road bike with really skinny tires. It's a breeze on my hybrid with touring tires. There is a total absence of trash or any other sort of debris as far as I can tell. The trail is mostly flat, until you get about 6 or 7 miles north of Monkton. From there, you begin a long but fairly gradual climb that reaches it highest point of 837 feet near New Freedom, just past the PA border. The northern portion of the trail seems more remote to me, so it is a good idea to bring along water and what you may need to fix a flat tire. Otherwise, it could be a long walk to a place where you can get help. 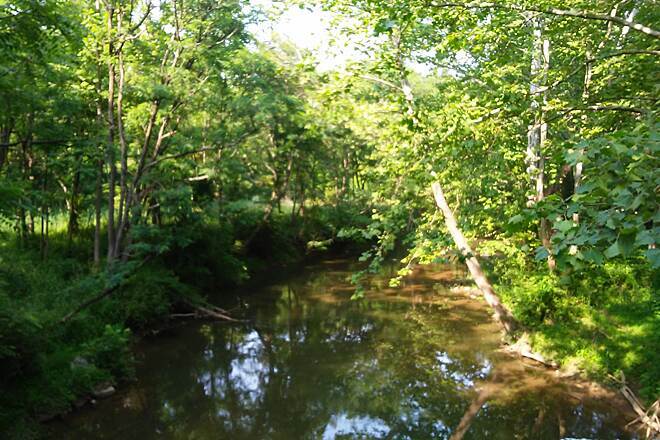 It's such a pleasant and peaceful ride, with the rushing water from Gunpowder Falls audible from several spots. 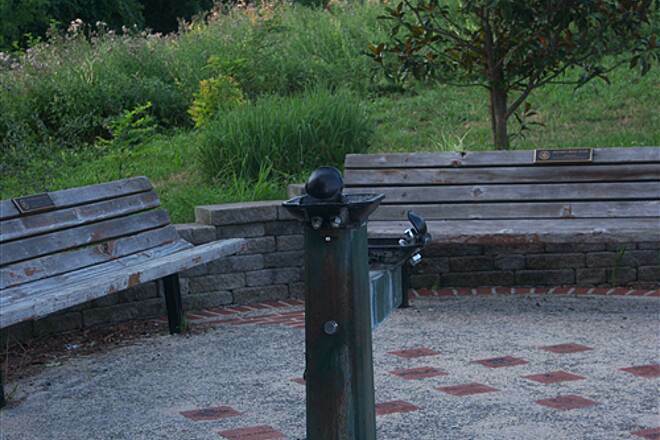 There are lots of stops to rest and enjoy the views in this beautiful park. There are picnic tables, bathrooms, and even a little snack bar set out by one of the local residents. Another thing that I really like is that the tree canopy is very thick the entire way, providing shelter from both the sun and the wind. It just doesn't get much better than this. 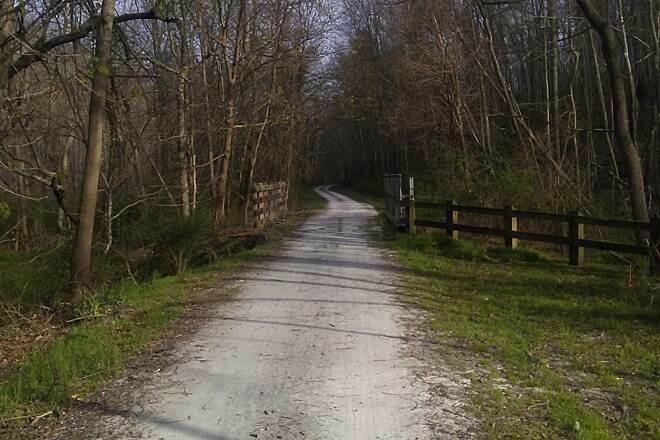 Besides the York County Rail Trail (this trail continues the Rail Trail south), this is one of the best trails to mush on. Any dogs (though our groups tends to have northern breeds like Siberians and Malamutes). Dogs love to run, and humans are too slooooooow. So we put them in sledding harnesses, hook them to a set of wheels (bike, scooter, rig)(or sleds when there is snow) and run on the trail. Bike-joring or scootering is an easy sport to do with one or two dogs. You train the basic commands on a leash. Dogs doing this sport are polite and under control ("on-by!" means no kissing the hikers! )and they are having a great time running off all that energy they would have used eating the couch. We run in cooler weather, and hike in summer. If you see us, stop and ask us about how mush fun it is! My husband and I and our 10 and 11 year old love this trail. Easy access, plenty of places to stop and take a break. It is a very popular trail for families, but for good reason, it is wide and pretty flat, which makes it easier for children. Lovely shade, perfect for summer rides. But get there early...lots of folks out when the summer gets hot. We've been riding or running this trail for years and it is so much busier than I remember it being. 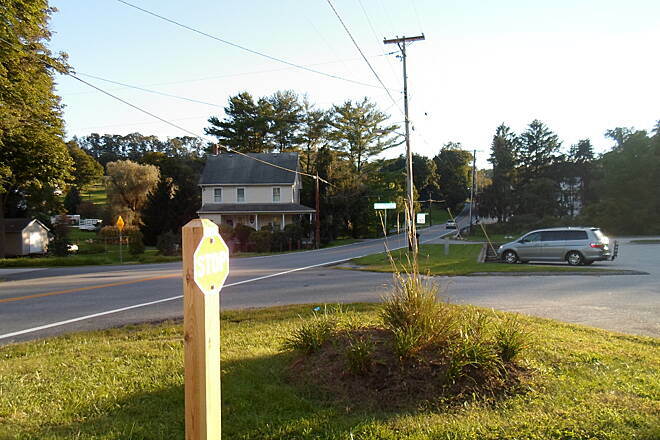 We always start at the Ashland trail head and go north to Monkton. Beautiful but be careful the maintence is a little lacking these days. Overall I highly recommend riding or running/walking this trail. Lots to see and do, our kids love it. Lately I have been riding this trail every weekend (usually the Paper Mill Road to Parkton segment, but occasionally up to the Pennsylvania state line. The last two trips I encountered deer (around Mile 10 both times). It's perfect for summer cycling because the whole length is shaded. I just love this trail. 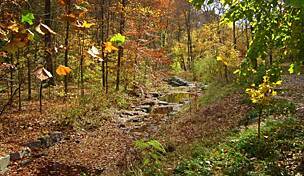 Rode about 30 miles of this trail 2 day, great day for a bike ride, well maintened trail, the water falls @ about White hall was spectualer. it's a little busy in the beginning if you start on south end, but it really gets better once you get away from all the walkers. Never biked over 30 miles before, and this trail we biked 40 miles! Pretty scenary and the hills aren't too bad which suprised me since we were headed towards PA and when driving on I83, they have huge hills! Typically don't bike a lot but was able to survive and enjoyed it and now glad i did that! We biked this trail on June 1 and 2, 2012. 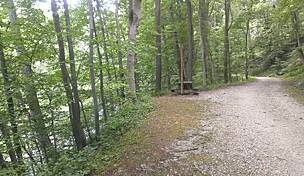 It is an excellent, well-maintained trail. Even on a busy weekend, the trail is long enough that there was never a feeling of being crowded. There is plenty of parking, so if one parking lot is full, just drive to the next one. The further north you go, the less crowded. 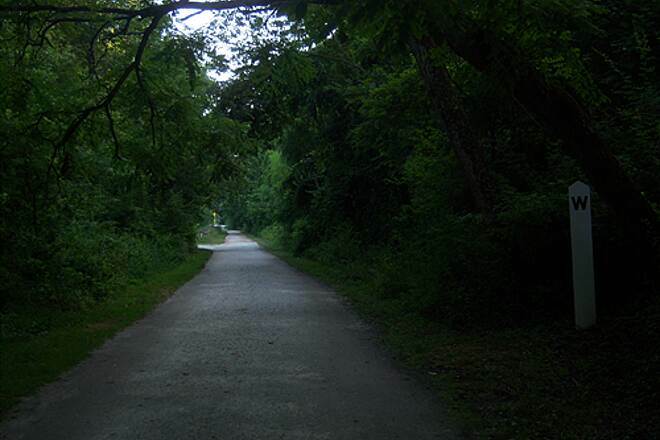 I rode this trail on May 7th 2012, a Monday, not very busy but the ride was very delightful. It was overcast and at one point it began to rain for about 20 min. The tree canopy was so thick that I barely got wet. I started out at the southern end and rode north. Due to time constaints I was only able to go about 10 miles to Bluemount Rd before turning back. 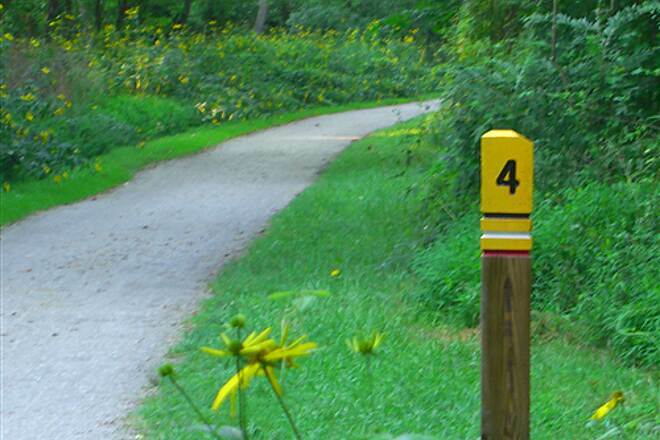 Its nice to have the mile markers along the way, along with plaques telling about local information along the trail. I look forward to going back a riding the entire 20 miles to PA. Bob A. 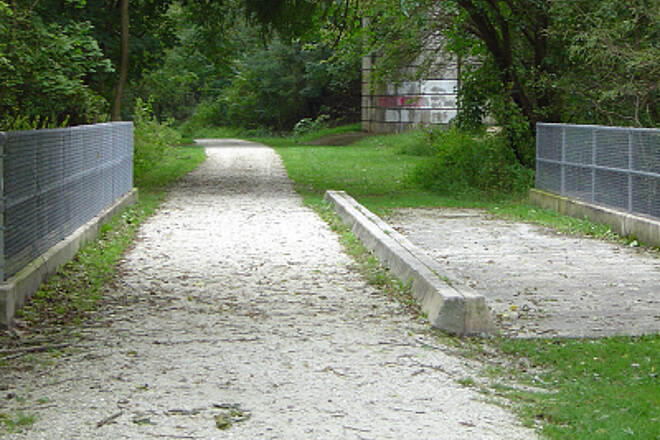 When it was constructed in 1984 along the abandoned North-Central Railroad, the Torrey C. Brown Rail Trail was one of the first rails-to-trails projects in the Mid-Atlantic Region. 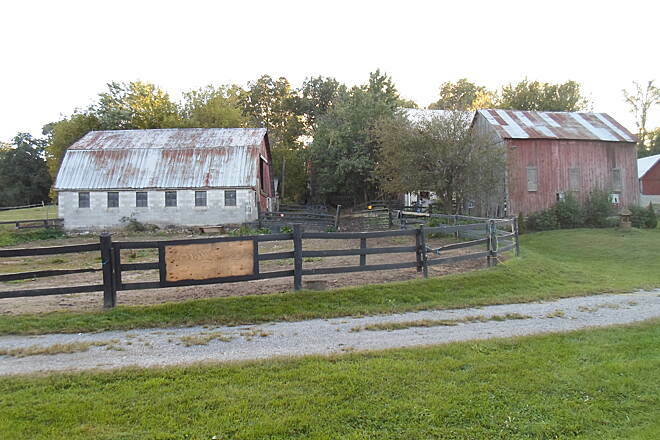 Local residents who had initially opposed the project changed their minds once they realized that hikers, cyclists and horseback riders did not pose a threat to their communities, and, to the contrary, presented new small business opportunities. 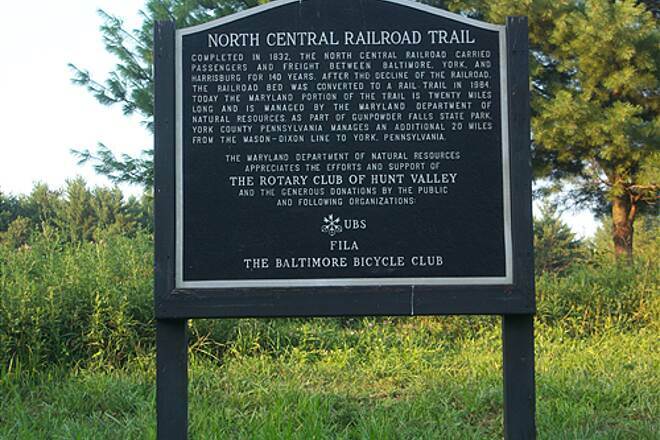 Today, the trail, in conjunction with the York County Heritage Rail Trail north of the Mason Dixon Line, forms the southern half of a multi-use greenway connecting downtown York with the northern Baltimore suburb of Hunt Valley. 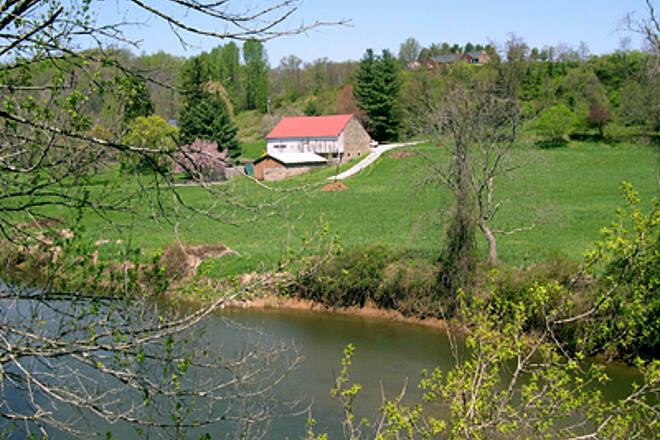 Aside from the first mile or so near the southern end, which is dominated by suburban subidivisions, most of the trail passes through scenic, rural countryside, though dense woodlands, sleepy hamlets witn names like Phoenix, Monkton, White Hall, Bee Tree and Freeland, as well as a coupleslightly larger towns like Parkton. While the railroad itself is long-gone (unlike the York County Heritage Rail Trail, which closely parallels a rail line that is technically still active, but has seen little use south of York city in recent years), relics of its existance, including old signal towers, mileposts, warning markers and train stations can still be seen at points all along the route. 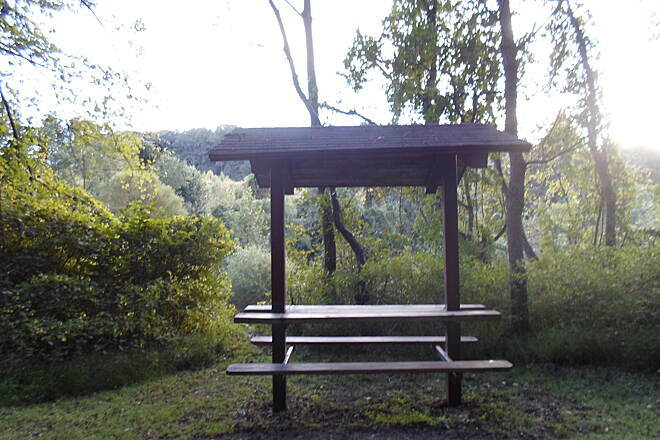 Amenities, including benches, picnic tables and interpretive signage are also plentiful. 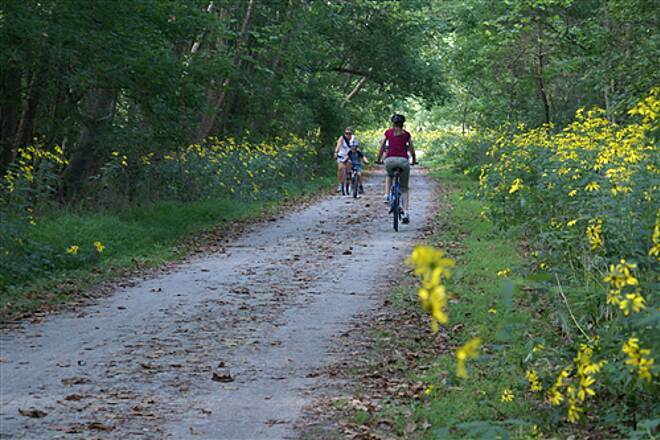 Cycling or hiking the Torrey Brown Rail Trail is a must for any trail lover who lives in north-central Maryland or south-central Pennsylvania. My son and I just finished riding the entire trail. 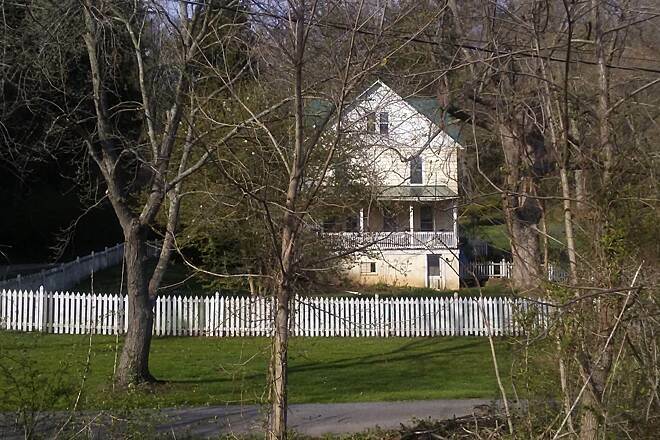 We started in York, PA at mile marker 17 along the Heritage trail and rode all the way down to Hunt Valley, MD. It took us five hours one way (37 miles - not bad for a thirty-something and his 9-year old son!). After spending the night in Hunt Valley we rode back, taking us just under 5 hours. The MD trail is quite nice. It's hard to compare it to the Heritage trail. 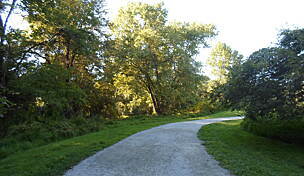 If you are expecting this trail to be like the Heritage trail you are in for a surprise. The variation of the trail is nice. From thick canopy to several open runs, it keeps your interest as you ride along. 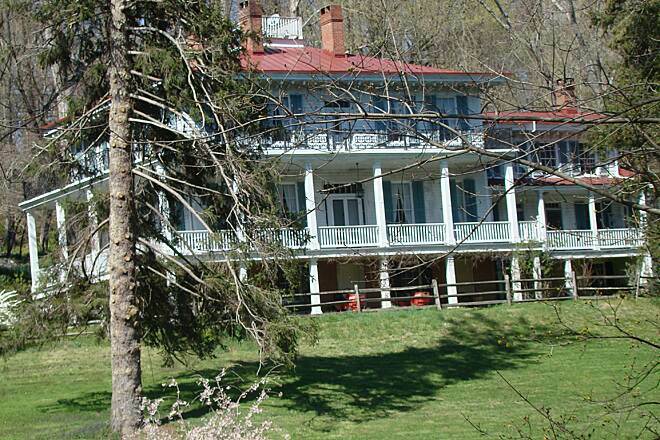 There is about a three-mile down hill immediately after crossing the PA/MD line. We enjoyed it south-bound and survived it north-bound. The picnic tables every several miles are nice places to snack and rest. 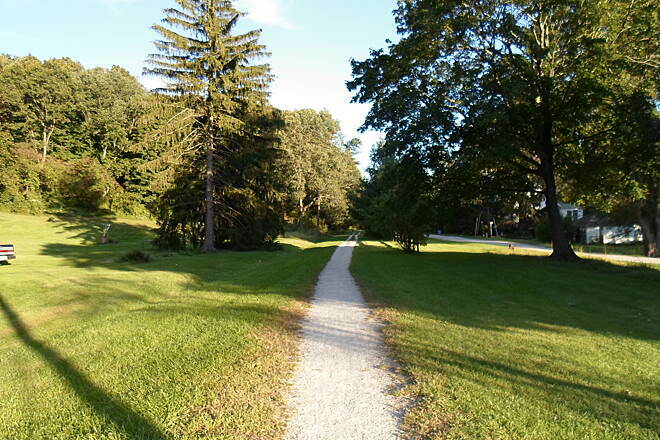 The trail ranges from a 10-ft wide path with a grass strip in the middle to a nice 20+ ft compact stone path. Since it was the 4th of July weekend, it was quite crowded but never difficult to navigate. There were the normal assortment of athletes and non-athletes with tubing folks carrying their tubes to various inputs along the creek that runs parallel. I think this will be an annual tradition! 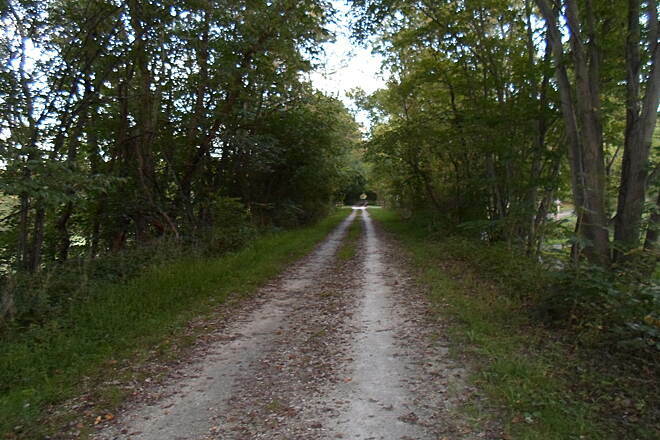 This trail is one of the very best Rails to Trails that I have redden. 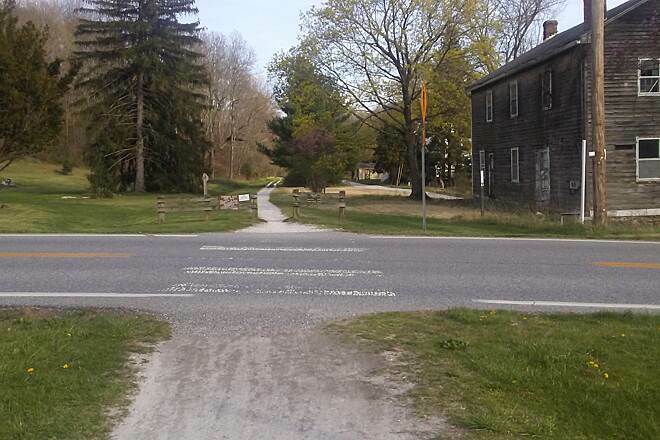 The Maryland Department of Natural Resources has done a great job of maintenance, from mowing the sides of the trail to picnic tables about every half miles, mile markers and at every crossroad it tells you the distance to the next two roads. I road from Cockeysville to Bentley Springs about 32 miles round trip. About 90% was under a tree canopy and that made the ride for me. The high light of the trip was the old Railroad Station at Monkton, it is like going back into the early thirty's. I did the trip on a mountain bike but you could do it on a road bike. This is a family friendly trail. I just tried this trail out today actually. I use a Trek Road Bike, and must say, I'm a bit disappointed. The trail was very unpaved and uncomfortable for a road bike. For a mountain bike, I'm sure that this trail is sufficient enough. But being a road bike, it started getting very uncomfortable around mile 5. There were a few spots that seemed very smooth so I'd greatly enjoy those spots. But for the most part, it was like riding a road bike on a mountain bike trail. The trail itself is very flat, which makes long distance riding fairly easy. A few inclines here, a few declines there. But none of which were the toll-taking kind. I think the terrain took it's tole more-so than the hills. It's a pretty narrow path too, and in some spots wet due to the tubers. I felt like there really was very little room to pass. There's no trails near White Marsh, Maryland, and it's private and the scenery is beautiful, so I can't exactly crucify it. It provided a long-distanced ride where I didn't have to worry about traffic. So for a road bike, I think 3 stars is deserving for my experience. 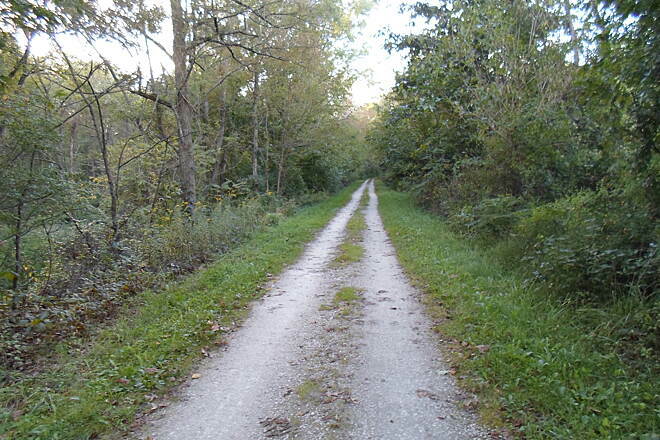 My son and I got our first taste of the North Central Railroad Trail on October 17th, riding the last five miles out and back on the trail after starting 1.5 miles North of the Mason-Dixon line at New Freedom on the York Heritage Trail. I would HATE to rate any functioning rail trail at less than four stars, as they are all wonderful by their very nature. and a trail like the NRCT, at 20+ miles, and connected to a 21 mile trail in Pennsylvania, is exceptional. That said, the NCRT is getting a bit long in the tooth, at least at the Northern end. The surface is hard as rock, which makes it fast but bumpy, even on a hybrid bike with front fork and seat shock absorbers. 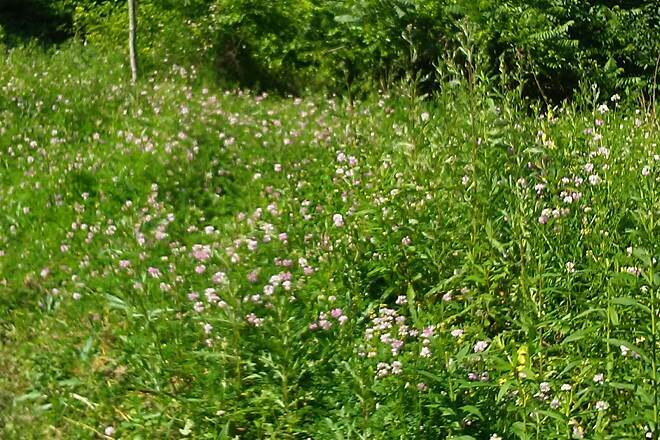 Also the brush is too close to the trail, and the trail itself has narrowed considerably over time and is pretty much reduced to two 24" tracks separated by 24" of grass/stone and 24" of grass on each side. That makes passing cyclists OK, but I would not like to come across a horse around some of the bends. My eleven year old son had an interesting comment on the NRCT trail...he said it is "mysterious". When I aked him what he meant, he said he never knew what was coming around the corner, and there were a lot of corners ;-}. The NRCT appears rougher still because of its proximity to the much younger York Heritage Rail Trail, which is stellar in its wide, smooth, well groomed bike/pedestrian path with horse lane for much of its length. The cafes, restaurants, taverns, B&B's, and well appointed parking areas, many with bathrooms, make for a very enjoyable experience. We are hoping that the lower 2/3 of the NRCT are nicer than the Northern third. My husband and I are new to biking. We are in our late 50's. Picked this trail because it was flat and went for a number of miles. We went on Sunday of Labor Day weekend. What a wonderful experience. We saw all sorts of bikers - all ages and sizes- and walkers and joggers. Everyone was very friendly. 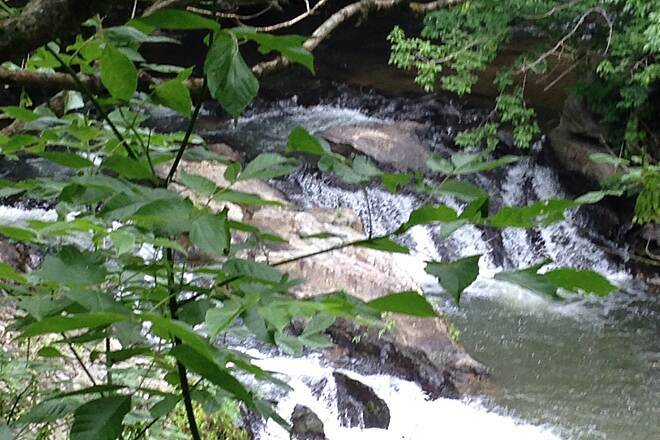 The views were beautiful of the woods and water. Would recommend going north first, very slight incline, but makes the return trip even better! Rode a portion of this trail with scouts a few years ago. 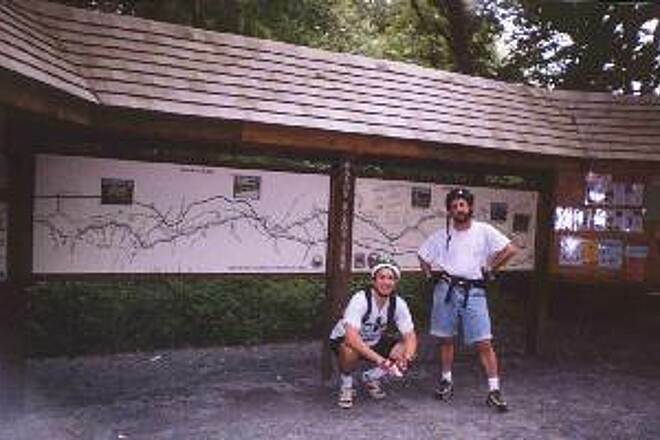 -- Learned from PA visitor center (from a brochure printed in 1999) that PA was also going the extend the trail farther North from York to park or State Park farther North. 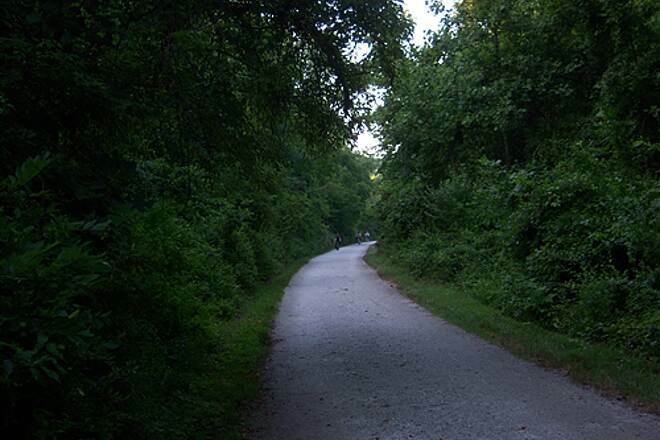 The Torrey C. Brown Rail Trail, which is more commonly known by its old name, the North Central Rail Trail, comprises the southern half of the greenway that connects downtown York (and is currently being extended further north to Rudy County Park) to Hunt Valley. Although the tracks that parallel the Heritage Rail Trail end at the Maryland line, old whistle posts, abandoned signal towers and numerous train stations serve as testiments to the trail's railroad heritage. 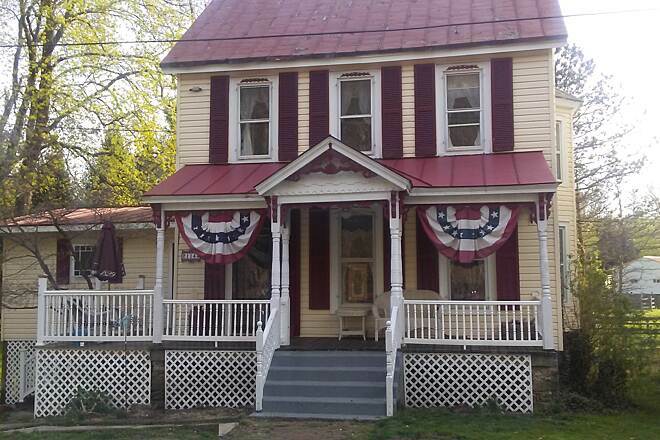 The picturesque combination of lush woodlands, bucolic farms and intimate small towns that makes the Heritage Trail so appealing also dominates the Maryland portion almost to Hunt Valley. Plans to eventually join the trail to the East Coast Greenway and the Jones Falls Trail will ensure its popularity for the foreseeable future. My wife and I have return to our first love--bike riding. We are empty nesters now. 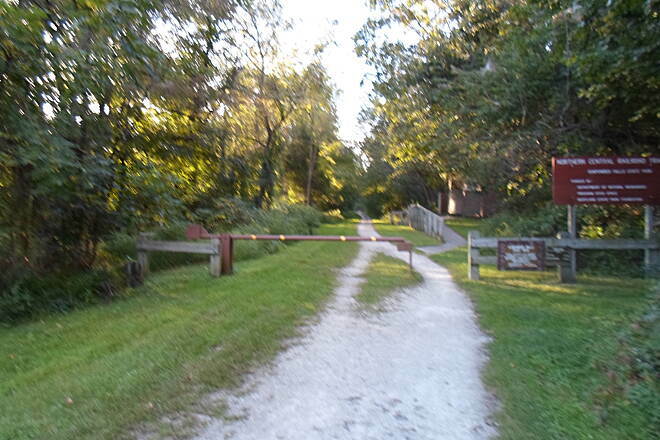 We had not realize what this 'Rail to Trail' thing was until this year. We use to ride on the streets of Baltimore. 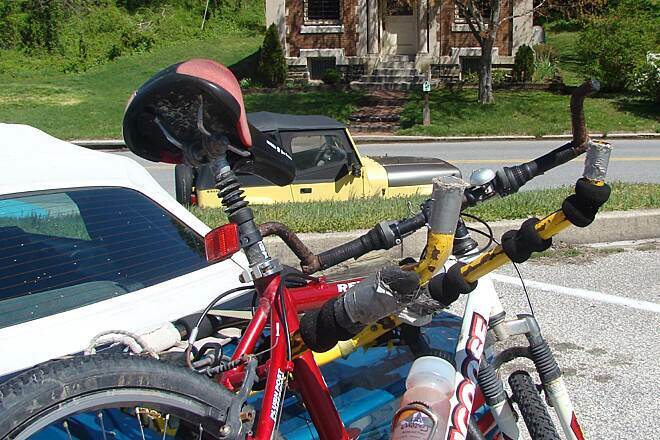 The bike rack stays on the car all summer. We take our bikes to whatever state we travel. This is our favorite trail because we live twenty minutes away from the Ashton trailhead (did'nt even know what a Trailhead was 6 months ago). We're still building up stamina. Today we rode from Ashton to Monkton. I understand thats approximately 71/2 miles. We learn to detect when we were getting near an excess point because the trail became busier with joggers, families etc. We people watched in Monkton. Oh and bike watched because I'm in the market for a new bike now. I was a little surprise when I went into the eatery at Monkton (7 miles works up an appitite) and ask for a large burger and found they only served veggie foods. I tried it but it didn't do well for my hunger. My wife had brought a granola bar with her. Ordinarily I would'nt eat those but----. The trail was great. Temperature was just right today. Came close to being dump by some fast little critters deciding to cross the trail just as I reach that point. All total we spent about 4 hours out. We know we can do 15 to 20 miles easily now. Broke in a new bike and we hate to see winter arrive just when we're starting to have fun. By the way we're seniors so judging by the way we feel we'll be hitting the bed early. 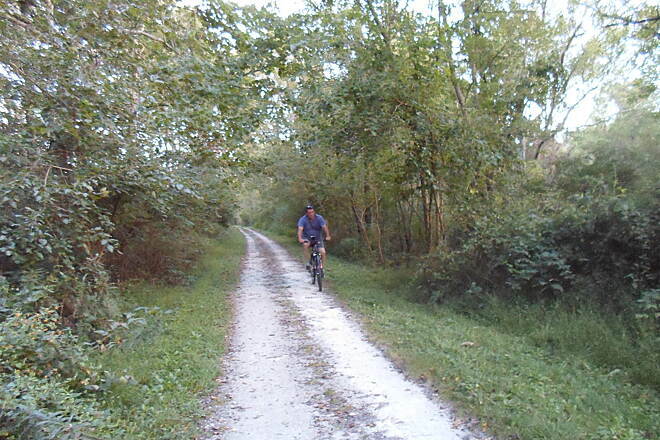 "Happy Trails"
I've ridden this trail dozens of times from the MD end into PA. The MD side starts fairly flat, then is a moderate but steady incline up to the PA border. 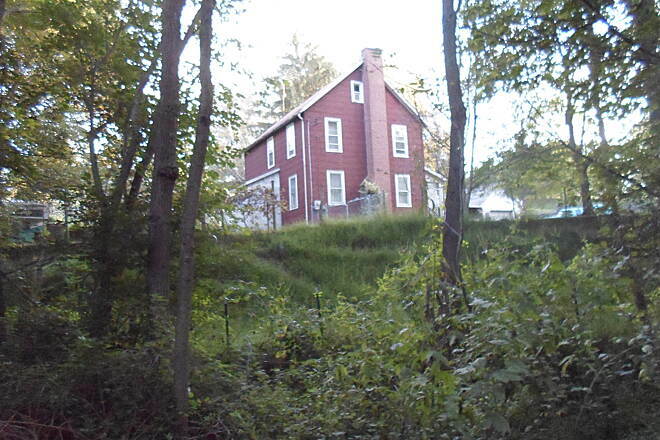 In PA the trail is generally downhill for 10-15 miles, but again only moderately. The PA side is very consistent crushed stone, and quite easy to ride on even with a road bike. 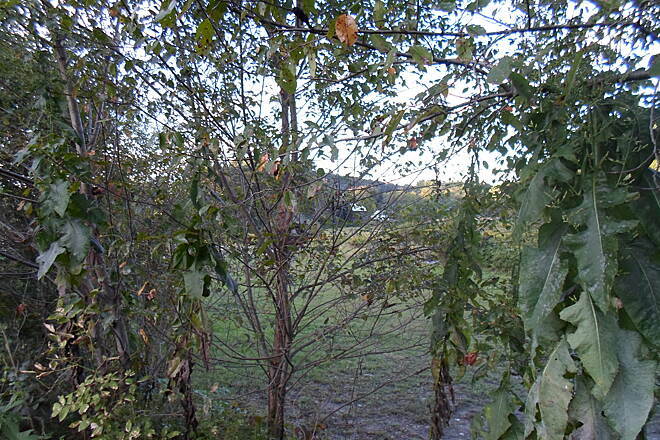 The terrain on the MD side varies quite a bit, but is generally packed dirt. 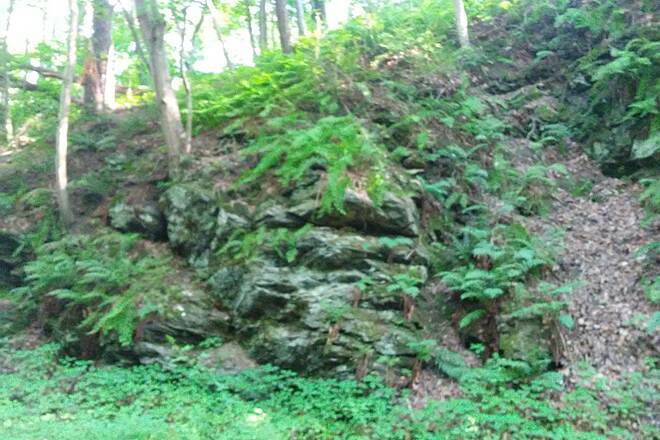 Some lengths of the trail also have a spattering of crush stone, but nothing consistent like the PA side. The MD side gets quite muddy following any type of rain. The MD side is pretty well shaded, so it is a good ride on hot days. In fall, it tends to be overly cool. The PA side is roughly half shaded. 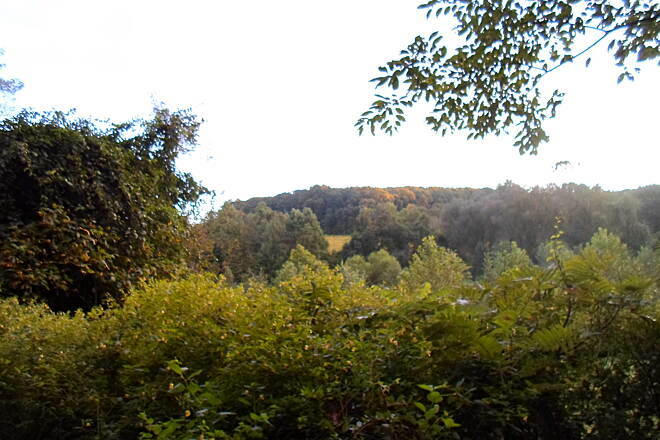 The trail in MD has limited scenery as the trail tends to be more like a hiking trail with woods close by on each side, while PA is more open, allowing some better views. The southern end of the trail in MD can be crowded, esp. on weekends, unless you get there early (the crowd dies down substantially once you get past the range station at mile marker 7). The PA side of the trail seldom is very crowded, so it makes a nice ride. Both sides of the trail have numerous road crossings, with metal gates blocking the trail except for narrow pass thru's, which tend to get a bit annoying for cycling since you are forced to slow down at each one. 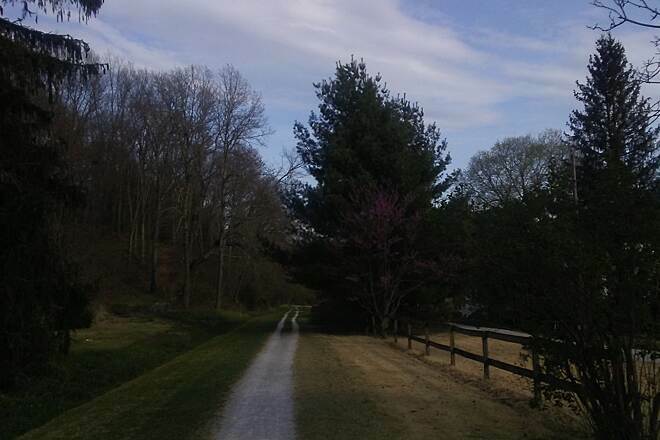 "I have cycled the combined North Central Railroad (NCR) Trail and York County Heritage (YCH) Trail many times both in sections and the entire length, up and back. 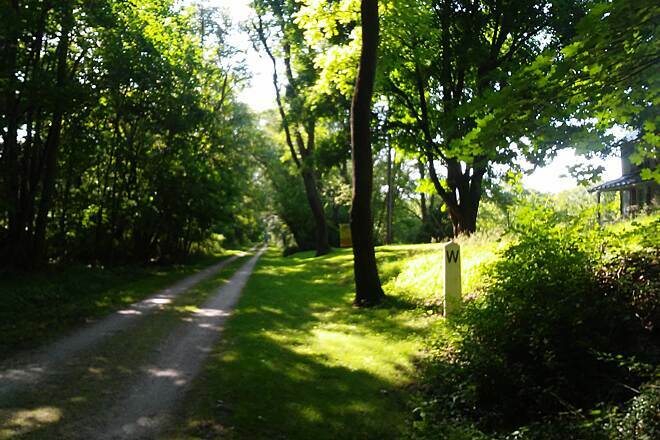 It is a well maintained trail and a fantastic resource for walkers, joggers, cyclist, horseback riders and others. I generally begin my rides at the south terminus (Ashland) and cycle north. 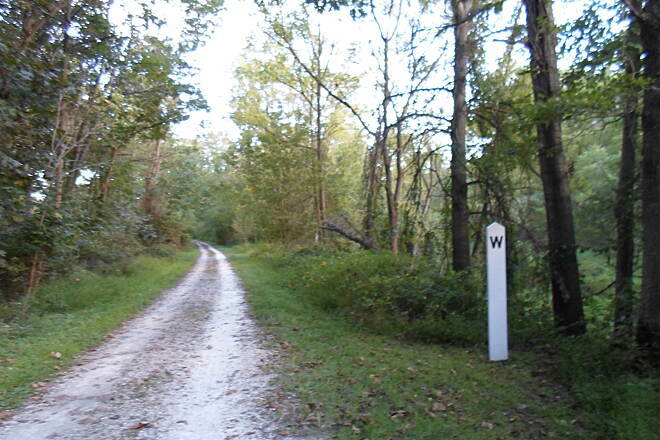 The trail is fairly flat until you reach MP15 where the grade increases to the MD-PA border. After crossing the state line, near New Freedom, the grade declines all the way to York, PA. It is not bad but is noticeable. 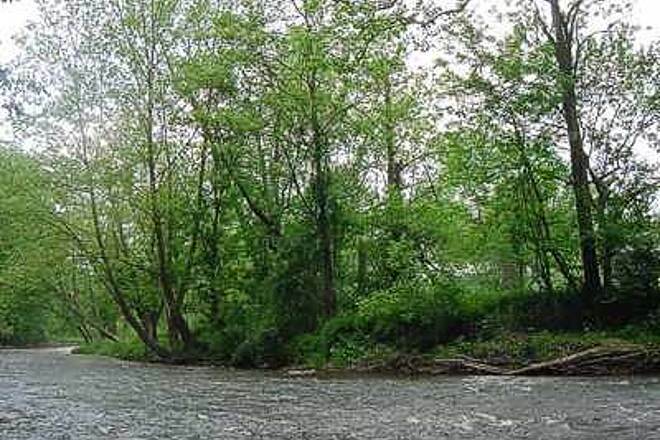 In general, I find the MD NCR, which parallels the Gunpowder Falls River, to be more scenic, shadier and with a quieter surface than the PA YCH which seems to focus more on the historic. The trail can get crowded near the trailheads on weekends and holidays but is for the most part peaceful. There are many places to access the trail and plenty of places to stop for a bite to eat along the way. Recommended." 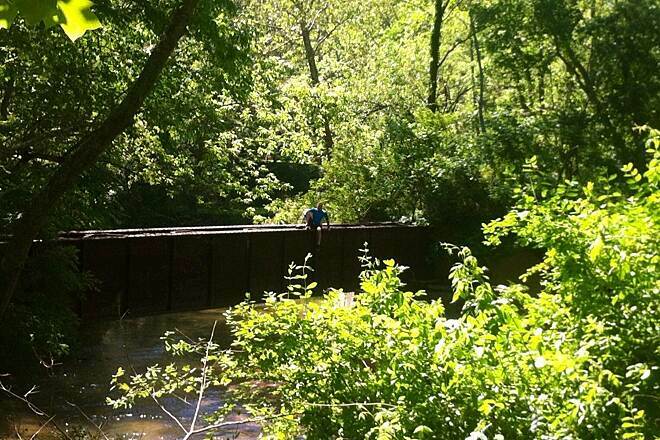 "Whether you go from the south to the north, or the other way, the NCR provides one of the best bike rides/hikes of any Rail to Trail. Hurray for all who make this one possible!" "I started riding this trail in June of 2003 and I must say that I really have grown to love it. My favorite ride is from Parkton to Hanover Station (about 37-38 miles round trip). 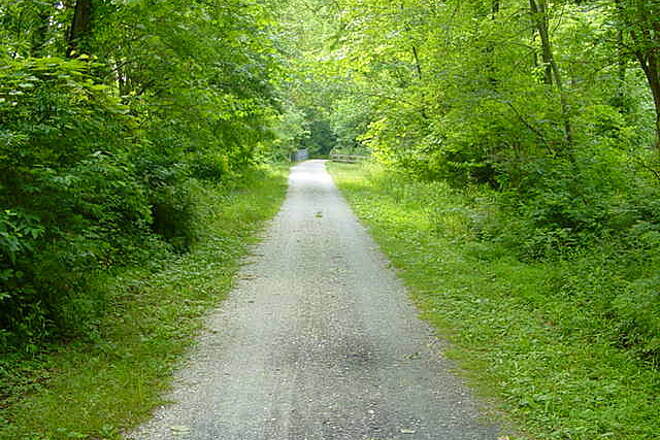 The trail is maintained fairly well and 99 percent of the users obey the ""road rules"" pretty well. My only wish is that there were more larger porta-potties (like the one at Bentley Springs) where you can take your bike in with you, as I always travel alone and have no one to watch my bike for me. 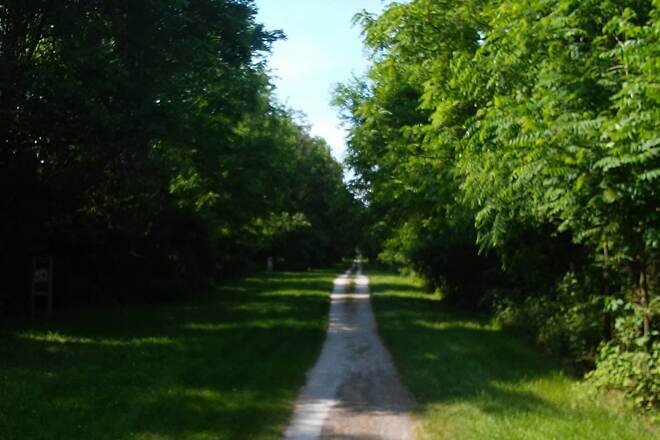 In my opinion, the Maryland side of the trail is much nicer than the Pennsylvania side simply because in Maryland most of the trail is in heavily wooded areas and the trees seem to envelop you as you ride - and I like that! Overall, I really love the whole trail and I highly recommend it. Happy cycling everyone!!" 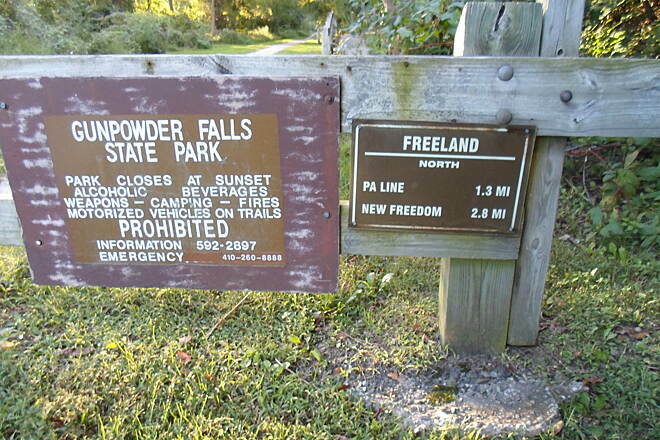 "I did a portion of this trail, accessing the trail in Freeland where I parked in the paved lot. It appears that most access lots have at least one pay phone (nice touch). Restrooms at this access are also nearby (of the recycling kind, sort of nasty). The surface is very smooth (stone dust). I rode 6.5 miles to the Parkton access and back again. 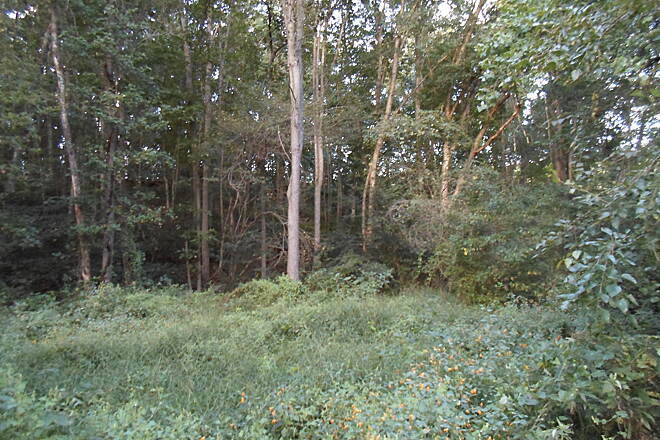 A good portion of this section runs through very wild, natural areas. I did it at sunset when it was getting dark; it was almost spooky riding through those woods. 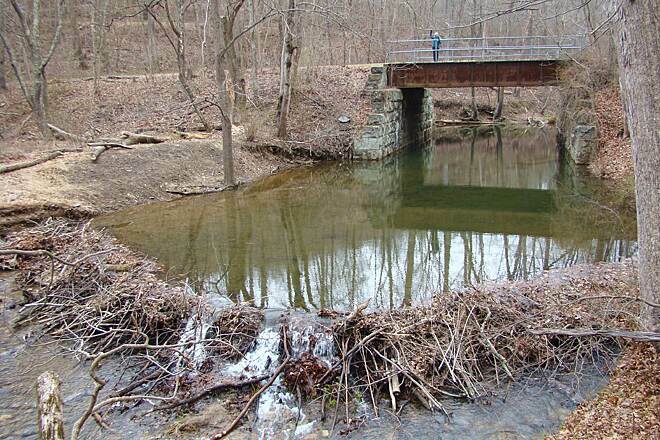 This trail comes under the auspices of Gunpowder Falls State Park and convieniences (restroms, benches, drinking water) are located along the trail, though some show signs of wear and age. Overall it was a very nice ride -- just do it. " 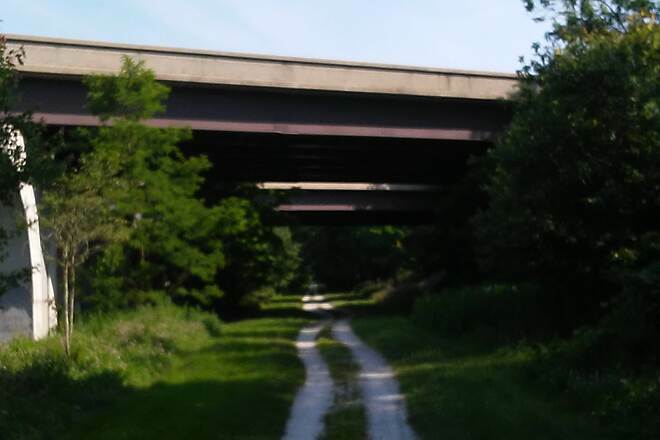 "After purchasing my Trek 4900 Mountain Bike I started out to find a trail to ride so I put my computer to work and came up on a trail called the Northern Central Railroad Trail. The scenery was breathtaking and the trail was surrounded by beautiful trees, running water falls, and lots of wildlife. I would highly recommend this trail to all levels of riders. " 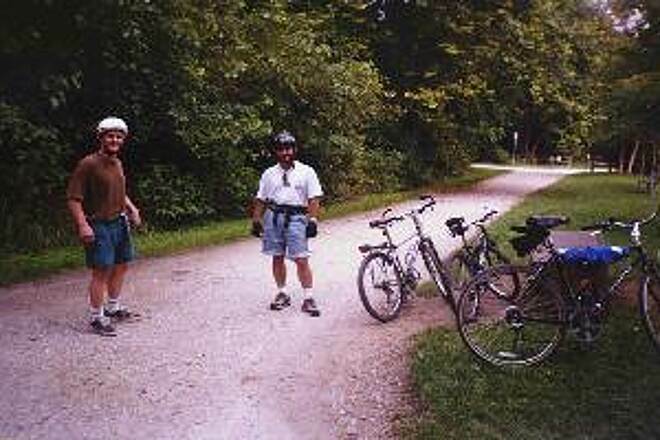 "On the last Sunday in April a friend and I rode this trail from Ashland to the Mason-Dixon line and then on to York on the Heritage Trail. All in all the trail rates an A for overall condition with an A+ for the parking lot at Ashton. As with all such public use areas it is important that users know and respect the rules and have patience for those who may not. 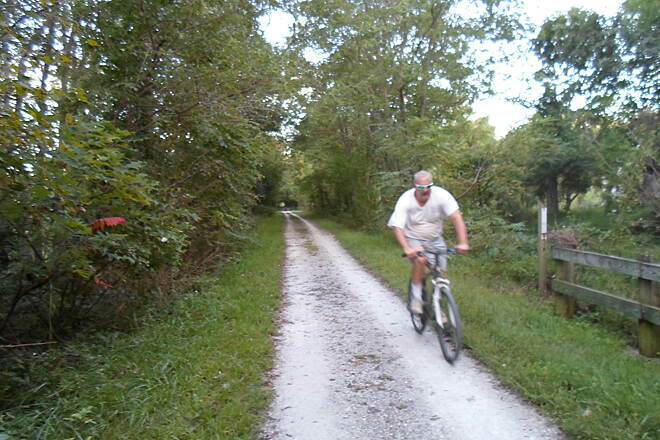 All in all, a WONDERFUL 82 mile roundtrip on a trail that epitomizes the rails-to-trails concept. 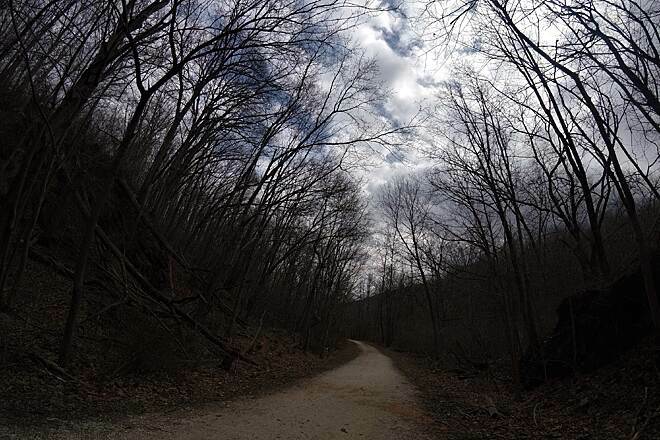 "Having ridden this trail since it opened I still find it to be a great ride. The only problem is on weekends when people don't obey the ""rules of the road."" While some riders do ""skinny up"" when other riders approach, far too many do not. They continue to ride side by side creating a potential situation for an accident. We all can have a lot of fun if we just remember we're not the only one on the trail and we don't own it." The new parking lot that was built on Paper Mill Road is great. Some of the parking along the road has been lost but the new spaces more than compensate. 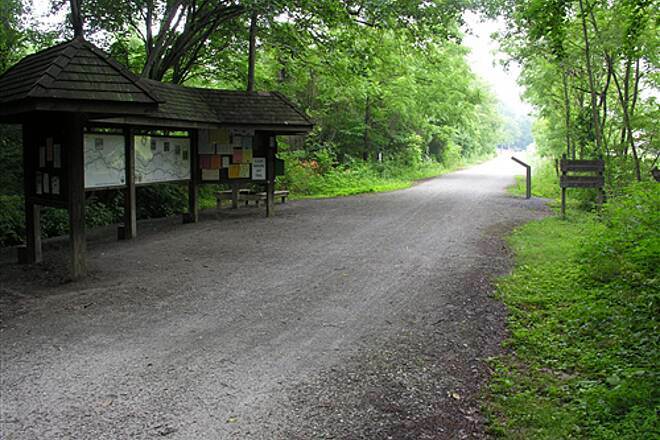 The trail was resurfaced in late summer of 2002. 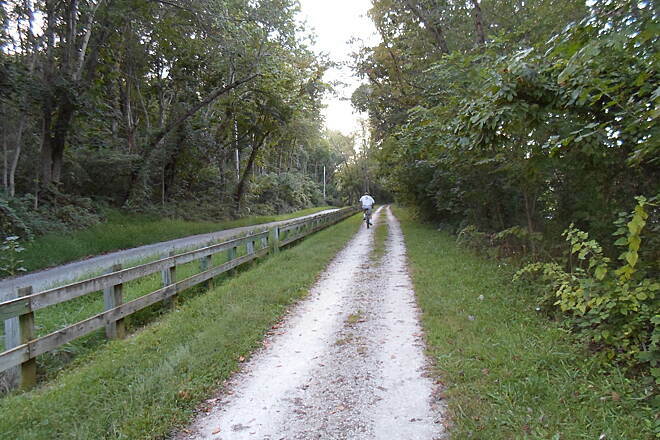 "We drove from Fairfax, Virginia, to ride this trail, and it was one of the nicest we've ridden. We read that parking at Ashland was limited, so we headed for Phoenix, but the road was closed. 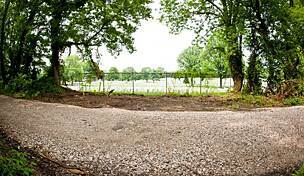 The Sparks lot was filled, but just west of it, before you cross the river on Sparks Road, there is an old park with an abandoned building. The building of course is off limits, but the parking lot is apparently legal. There's room for at least 10 cars. 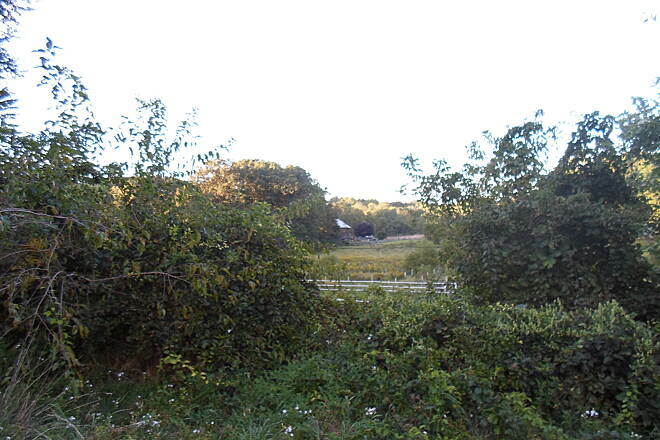 The ride from the trail back up to the lot is a steep but very short climb. " 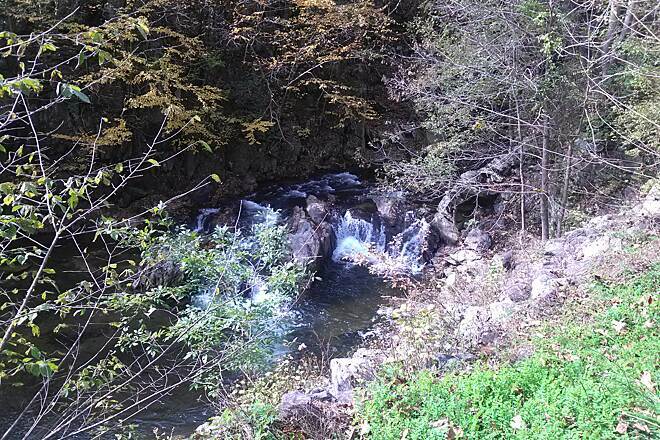 "Very well maintained trail with great scenery! 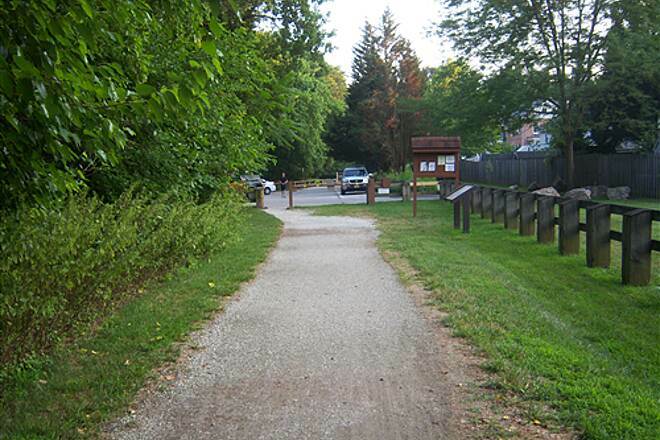 As of 9/8/02, the trail has been resurfaced. Today I rode from Bentley Springs to Monkton and back, and I must say, this trail is super smooth!" 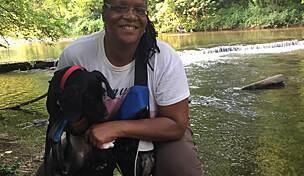 "I did 42 miles on the NCR, and I thought that the trail was extremely well maintained. 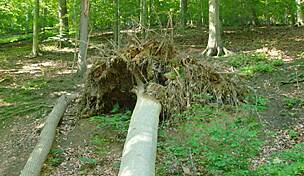 (There was one tree down from a recent storm.) Enjoy!" 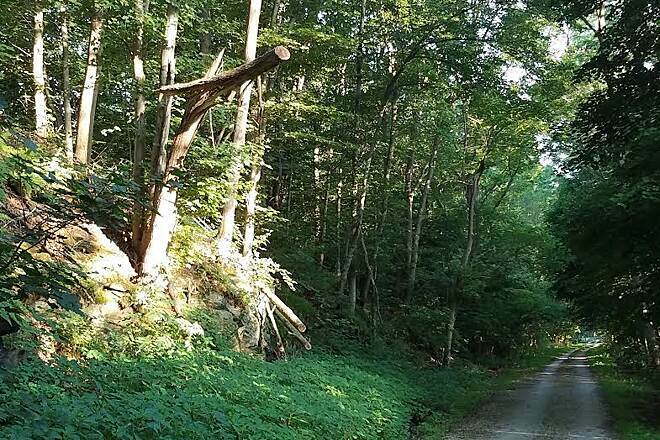 "Gem of a trail, but poorly maintained"
"This trail from Ashland to the Mason-Dixon Line is a beautiful, scenic trail. Adequate facilities and parking areas spread out along the full 21 miles. There are no eating facilities or any place to pick up a snack, except a coke machine at the Monkton Station. 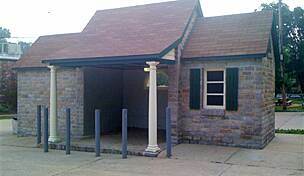 Monkton Station is closed during the winter months except for bathroom facilities. Summer it's open from Wednesday through Sunday. Spring & Fall Sporadically. The biggest problem with this trail is maintance. The surface has potholes, very rough sections on the northern part where the original ballast is working its way to the surface and forget about riding it after a rain, or be prepared to get very muddy and gritty. Watch for the blackberry branches that hit you in the face as you pedal along. It is my understanding that the entire trail is to be ditched, graded and widened, then resurfaced sometime this summer. 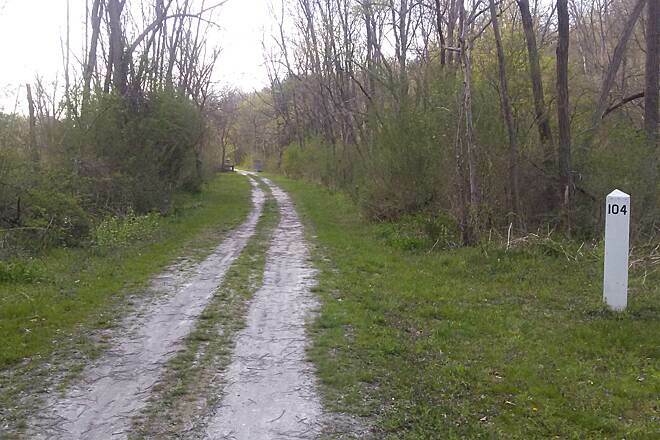 Lets see if the DNR can come through and restore this gem of a trail. " 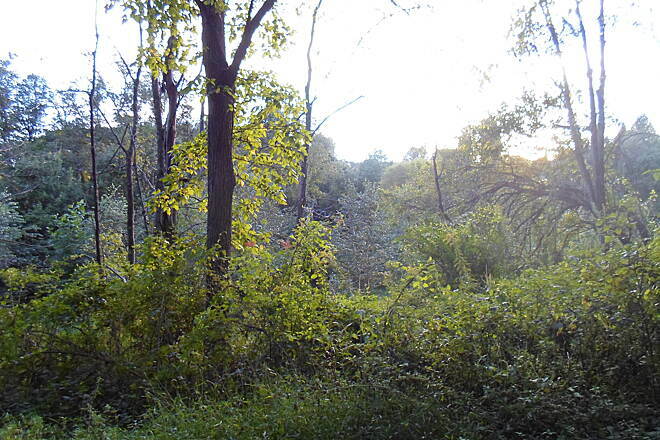 "Pretty scenery, all downhill from New Freedom, in PA, trail surface not always the greatest, some spots muddy after rain, but basically it's a nice trail." "Nice mostly level, wide trail"
"We covered this trail and also 1.5 miles of the York County Heritage trail which connects to the NCR in PA. The trail is fairly wide and surface is good for hybrid bikes and mountain bikes, although a road bike probably could do most parts of this trail as well. The trail has good restroom and water facilities. 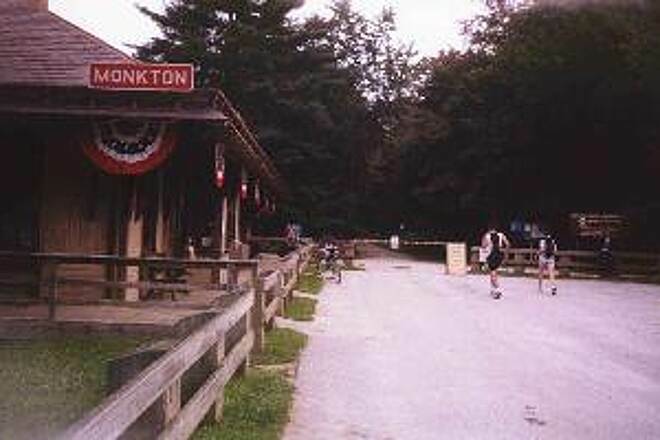 The converted train station at Monkton serves as the trail headquarters and has good services for hikers and bikers. You can purchase items geared towards the trail here and get information about upcoming rides/events. After this, facilities with food are rather sparse until PA. 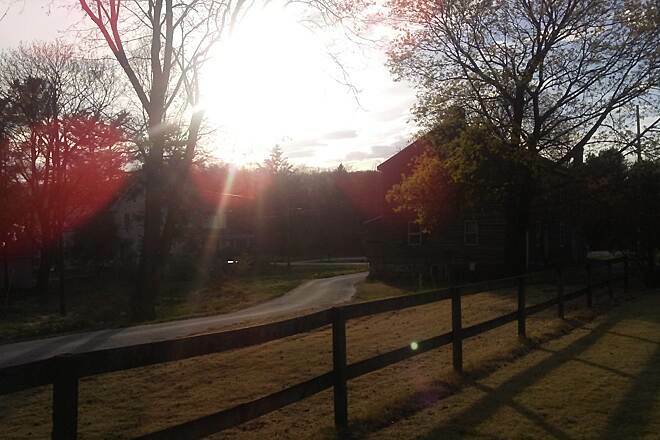 The trail goes up hill at Parkton (and you feel it) all the way to New Freedom PA. There is good scenary along the trail as it follows Gunpowder Falls River where tubers can be seen (we didn't the day we rode, though). 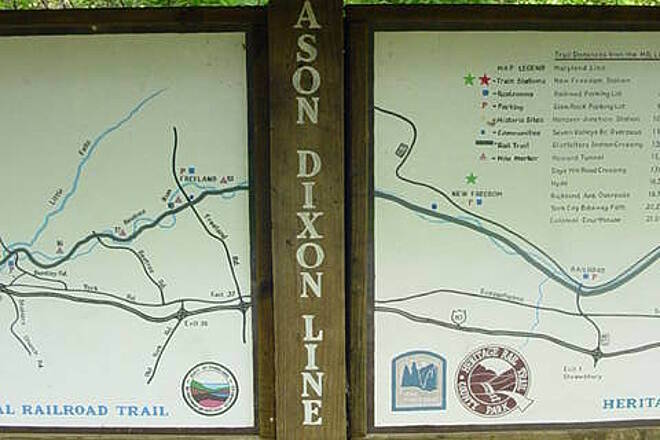 At the PA border is a map of the entire trail which is split in two by the Mason Dixon line. 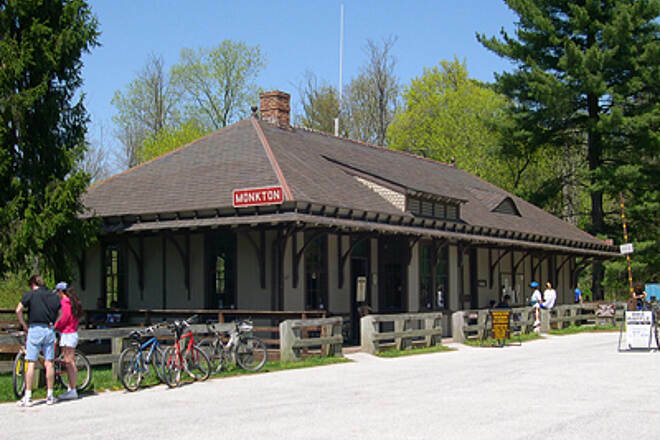 At New Freedom PA, there's a dinner excursion train which runs by the trail into PA. Also at New Freedom, there's the Trail Mix restaurant and it caters to bikers with good soup, snacks, drinks, muffins, bagels, etc. There seemed to be other places to grab a bite as well but this one was at our turn around point as right along the trail. If the trail gets wet, be prepared for really cleaning your bike and yourself thoroughly. It rained when we were on it and everyone had a stripe down their back from the mud and grit. Legs were covered in it. When the weather's nice, this trail has many groups of all skill levels on it. Be prepared to use verbal signals to pass or to stop. Cross car traffic wasn't much of a problem on this trail. Hopefully, can report more on the YCH in another review. Feel free to email if you have questions." 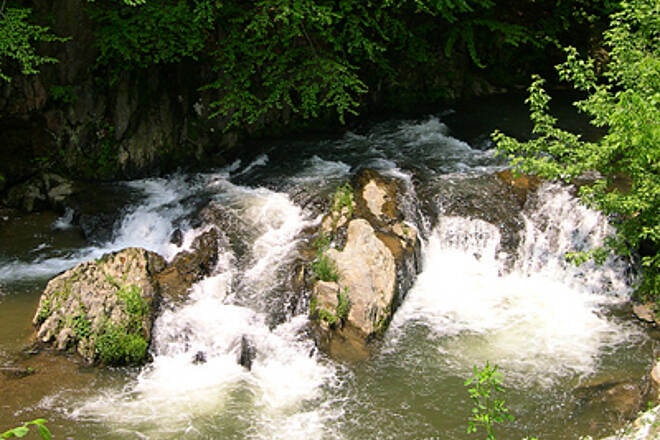 "This is a fabulous trail. It's pretty, well-maintained and excellent riding. One could do it on a road bike, though wider tires will be appreciated. " 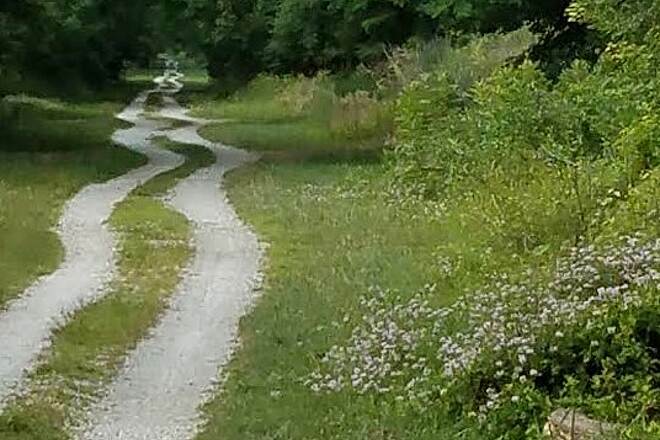 "I just recently started to ride my bike on this trail. It is wonderful, and my husband and I have been on it several times already. Parkton is as far as we made it. "